MAGICAL! HAUNTED MOJAVE PHONE BOOTH! 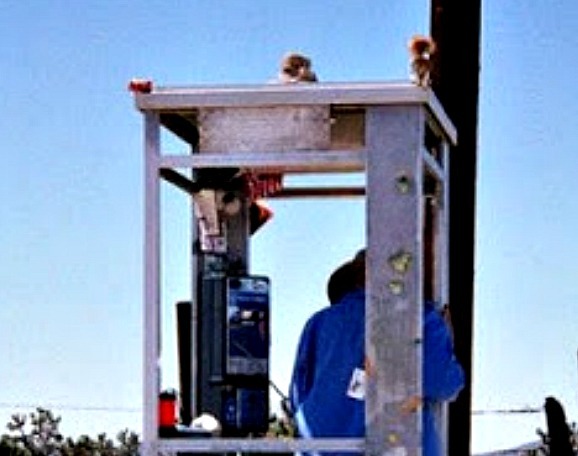 MANY ECCENTRIC THINK THIS LOST PHONE BOOTH, HAS AT TIMES A MACABRE OR EUPHORIC ENERGY TO IT... I HAVE TO AGREE==THE PHONE BOOTH CAN BE DESCRIBED AS HAUNTED OR GHOSTLY AND VERY INTRIGUING. 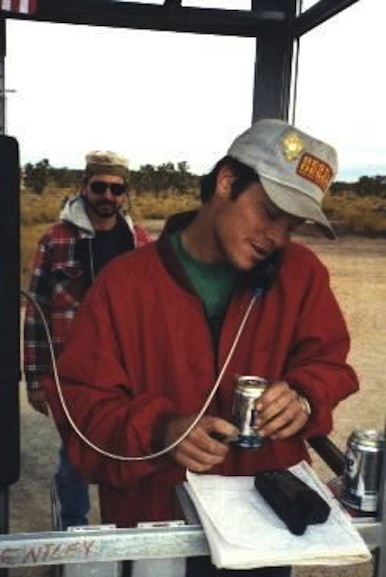 KEEP THE MEMORY ALIVE--DOC's MOJAVE PHONE BOOTH KICKSTARTER LINK = BOTTOM OF PAGE! PERHAPS THE PHONE BOOTH'S ODD ENERGY COMES FROM ITS LOCATION OR BY THE PEOPLE WHO HAVE VISITED IT. OR BY THE MOJO THAT WAS OMITTED FROM THE PEOPLE WHO PHONED IN? 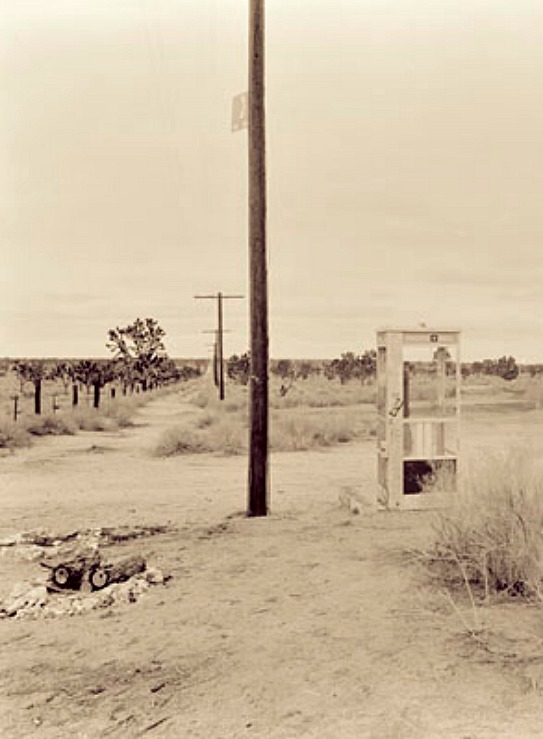 THE PHONE BOOTH WAS PUT IN PLACE CIRCA 1965-- SOME PEOPLE ARM CHAIR EXPERTS AND NOW PASSED ON DESERT RATS, CLAIM THAT (EXACTLY) IN 1960, THE PHONE AND BOOTH WERE SET UP IN THE MIDDLE OF NOWHERE. I DARE SAY -- EL WRONGO! 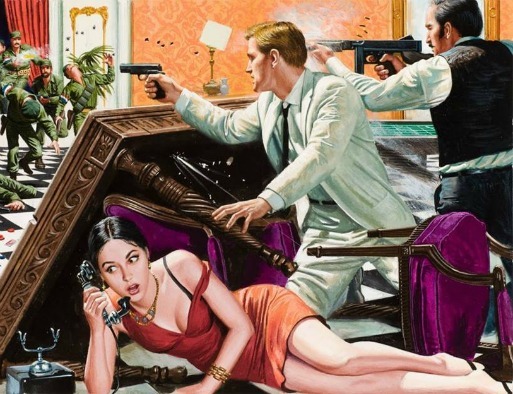 WITH DIPLOMACY, DURING THE MID 1960s, THE PHONE BOX SET UP. 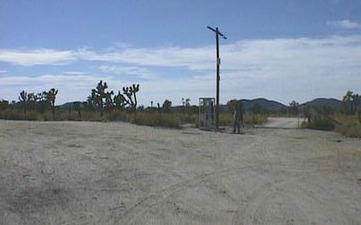 FROM 1948 TO THE MID 1960s THERE WAS A DESERT PHONE AT WHERE THE PHONE BOOTH WAS LATER LOCATED. THIS PHONE WAS NOT ENCOMPASSED BY A GLASS PHONE BOOTH. THIS PHONE WAS POWERED BY A HAND CRANK DYNAMO. -------- NO MONEY WAS NEEDED TO USE IT. THE PHONE WAS INSIDE A WOODEN BOX THAT WAS ATTACHED TO A WOODEN POLE. A GUNNY SACK LIKE MATERIAL COVERED THE WOODEN BOX's FRONT AREA. 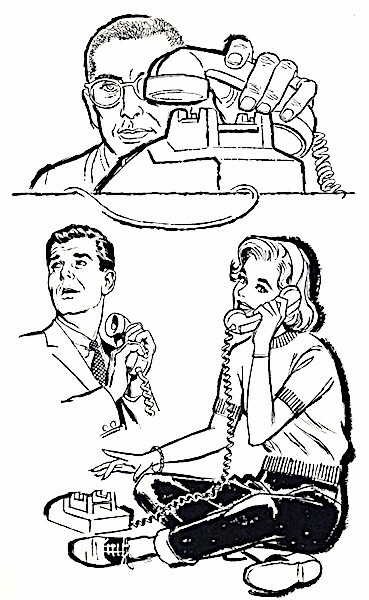 FROM THE 1960s ONWARD (MID 1960s -EXACT DATE IS HAZY) THE PHONE BECAME A PAY PHONE---- YES! 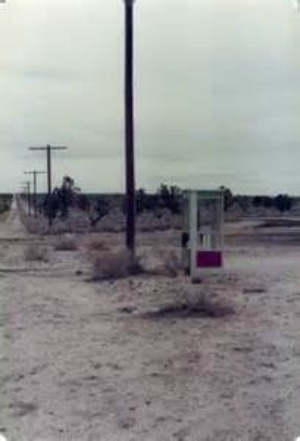 A PAY PHONE IN THE MIDDLE OF THE MOJAVE! AS STATED BEFORE-- THE HANDCRANK DYNAMO PHONE WAS REPLACED BY A PAYPHONE AND BOOTH. 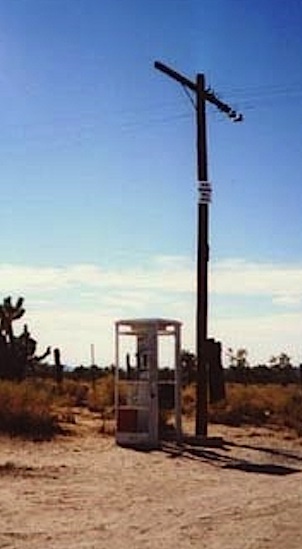 THIS PHONE OUT IN THE MIDDLE OF NOWHERE -- GRABBED MY ATTENTION, OR I FIRST HEARD ABOUT IT IN OCTOBER 1965, HEADED FOR CALIFORNIA, ON OLD WONDERFUL ROUTE 66. THE IDEA THAT A DEHYDRATED PERSON STRANDED IN THE OUTBACK, THEIR VEHICLE BROKEN DOWN, AND ALL THEY HAVE TO DO IS GET TO THE PHONE AND HELP IS ON THE WAY, SOUNDED LIKE A GRAND IDEA. AT THE TIME WHEN THE PHONE WAS PUT IN, UP UNTIL 1980-1983. THE GHOSTLY OR HAUNTED PHONE BOOTH WAS MAYBE 30 MILES AWAY FROM CIVILIZATION AND ABOUT 15 MILES FROM A PAVED ROAD OR HIGHWAY. 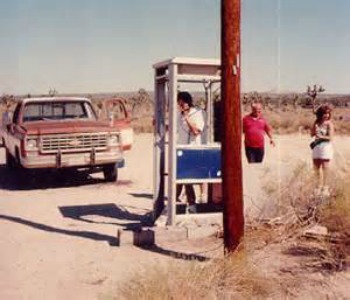 FROM THE LATE 1970s ONWARD--CIVILIZATION CREEPED TOWARDS THE DESERT PHONE BOOTH. TO GET TO THE PHONE BOOTH, ONE COULD DRIVE UNDER A LINE OF TELEPHONE POLES THAT HAD AN OVERGROWN SERVICE PATH. IT WAS A JEEP - MOTORBIKE TYPE ROAD. ANOTHER ROUTE FOR BIKERS WAS TO TRAVEL A FEW ARROYOS OR SAND GULLIES THAT MET ROUGH ROAD THAT LED TO THE BOOTH. 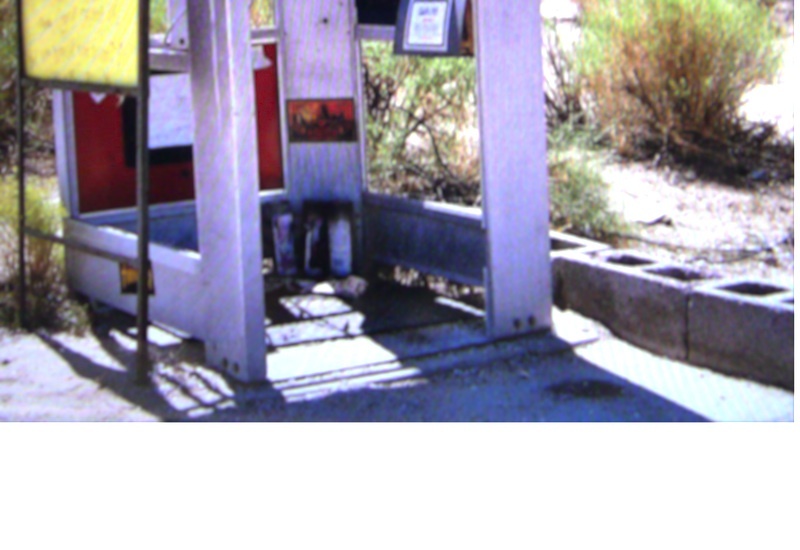 THAT ABOVE MENTIONED ROUGH DESERT WILDERNESS ROAD LED TO THE HAND CRANK PHONE AND LATER TO THE PHONE BOOTH. AS THE SECRET GOT OUT ABOUT THIS ISOLATED PHONE BOX, THE TOUGH TRAC BECAME MUCH EASIER TO TRAVEL DUE TO THE TRAFFIC. THE PILGRIMS' VEHICLES PACKED DOWN THE EARTH AND EXPANDING THE WIDTH OF THE LANE. BECAUSE MORE AND MORE PEOPLE WERE TRAVELING DOWN THIS PATH. BY THE 1970s THAT SANDY LANE HAD BECOME A WIDE ROAD DUE TO TRAFFIC. FOR A BRIEF WHILE IN THE 1970s HUEY MILITARY HELICOPTERS USED TO FY THE AREA. THE BAD JOKE WAS, THE CRAFT WERE PART OF AN INVESTIGATION. THE PHONE BOOTH WAS A DOORWAY TO ANOTHER REALM. IN ALL REALITY THE HUEYS WERE GETTING A BEARING OR ON AN EXERCISE. THERE WERE SOME HUMOROUS MESSAGES SCRAWLED ON THE PHONE BOOTH ABOUT BEING ABDUCTED. 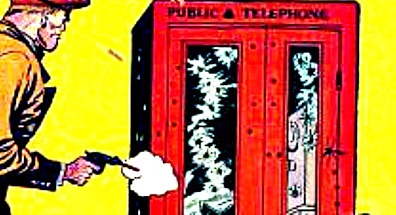 IN MANY WAYS, THE PHONE BOOTH WAS A PORTAL TO ANOTHER REALM, BY WAY OF PHONING IN OR OUT. 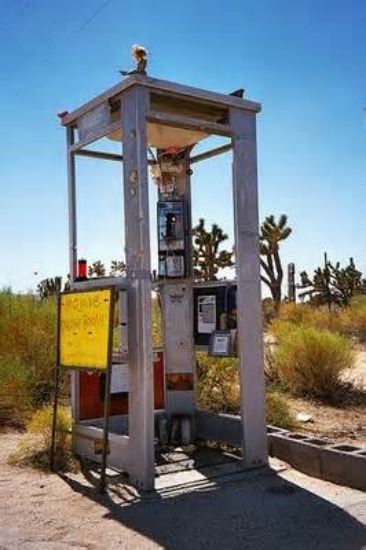 BEFORE YOU GO ANY FURTHER -- KNOW THAT THE MOJAVE PHONE BOOTH NO LONGER EXISTS. I WOULD LIKE TO THINK IT DEMATERIALIZED INTO ANOTHER WORLD OF HAPPINESS AND JOY. THE PHONE AND CUBICLE WAS TAKEN AWAY BY THE PHONE COMPANY SO MANY YEARS AGO. TO BE EXACT, WEDNESDAY MORNING, MAY 17, 2000. 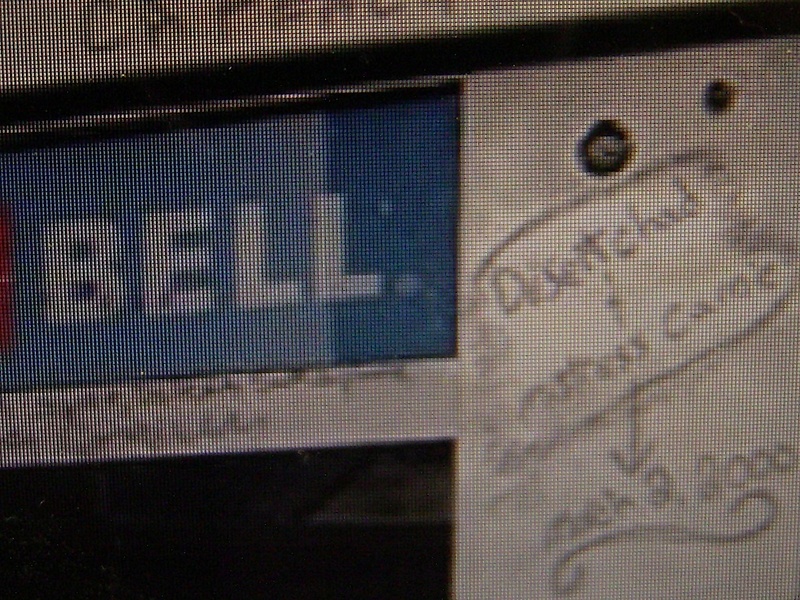 RUMOR HAS IT THE PHONE BOX WAS THEN DESTROYED BY THE BLM MEANIES AND CAL BELL (MA BELL) PHONE COPS. OFFICIALLY THE PHONE WAS REGISTERED AS THE CINDER MINE PHONE AND ITS LOCATION WAS ON CINDER MINE ROAD OR AIKEN CINDER MINE ROAD. THE PHONE AND ROAD HAD MANY NICKNAMES. 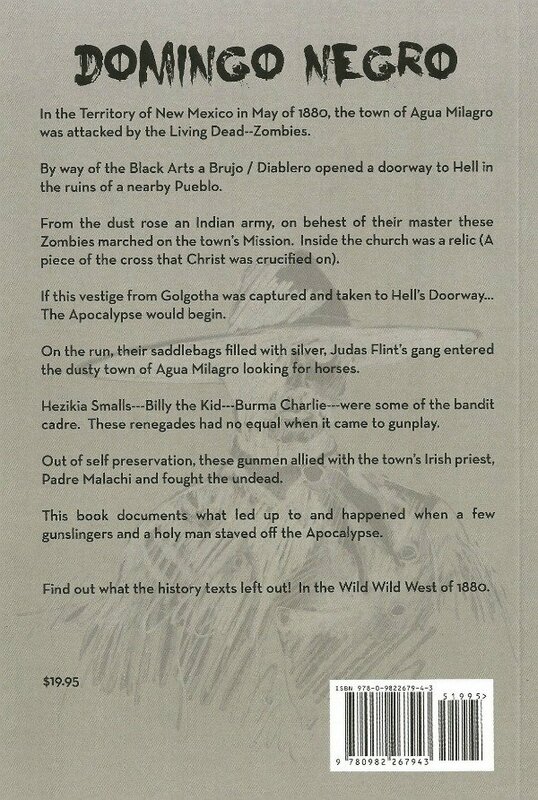 KICKSTARTER FUND FOR BOOK & MAYBE DVD ON THE MOJAVE PHONE BOOTH IS AT BOTTOM OF PAGE; THE MAN IN CHARGE = DOC DANIELS, THE MAN IS LEGITIMATE -- DOC IS THE CHRISTOPHER COLUMBUS OF THE MPB. MORE ON THAT LATER. CONTRIBUTE EVEN IF ITS $1 AND YOU GET GOOD KARMA. 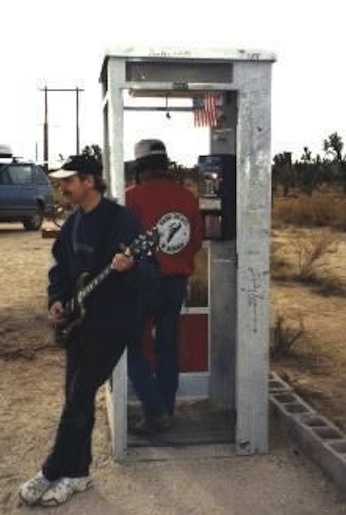 A VIDEO OF DOC's CONCERNING THE MOJAVE PHONE BOOTH IS ALSO BY HIS LINK, THE MAN HAS TALENT! SAVE THE MPB BY WAY OF A BOOK OF MEMORIES! DOC IS THE ONLY GUY DOING THIS-- WHY NOT HELP OUT! IN THE PAST PEOPLE HAVE SAID- THERE ARE TOO MANY LINKS ON THIS SITE-- OKAY! NOW THERE IS JUST ONE. NEAR BOTOM OF PAGE BY HIS ICON YOU CAN GET TO KICKSTARTER. 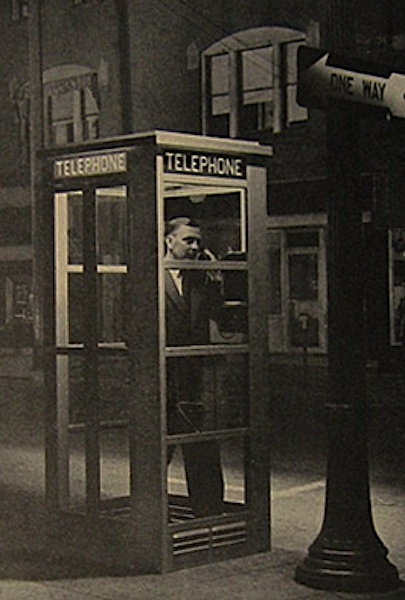 ORIGINALLY: IN THE 1960s THE PHONE BOOTH WAS A S.O.S. LINE FOR PEOPLE IN THE AREA WHO HAD NO PHONE -- MINERS, (CINDER MINE) HOMESTEADERS OR THOSE THAT GOT LOST IN THE DESERT, HAD A PLACE TO CALL FOR HELP. 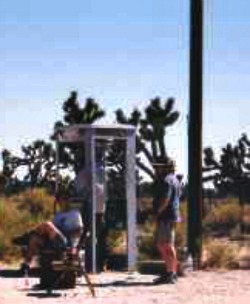 THE MOJAVE TELEPHONE BOOTH IS LOCATED WHERE THE ROAD MEETS THE TELEPHONE LINE TRAIL. THIS PHOTO DOES NOT SHOW VERY WELL, THE GULLIES OR ARROYOS THAT INTERSECT THE DESERT ROAD THAT LEADS TO THE MPB. 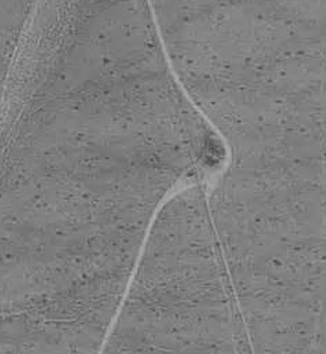 BEFORE YOU GET TO THE PHOTOS AND MORE DATA ABOUT THIS STRANGE AND MAGICAL PLACE IN THE DESERT! 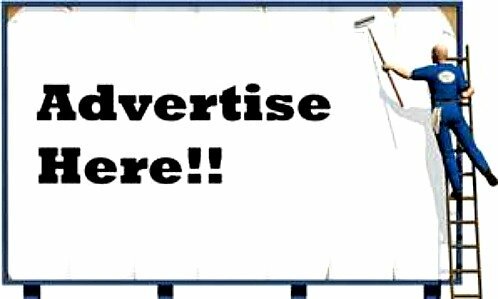 FIRST---- & SECOND BELOW A LINK AND A PROMO FOR ADVERTISEMENT ON THIS SITE! UNIQUE WEBSITE THAT IS VISITED BY ALL DEMOGRAPHICS! THE GHOSTLY OR HAUNTED PHONE BOOTH WAS MAYBE 30 MILES AWAY FROM CIVILIZATION AND ABOUT 15 MILES FROM A PAVED ROAD OR HIGHWAY. 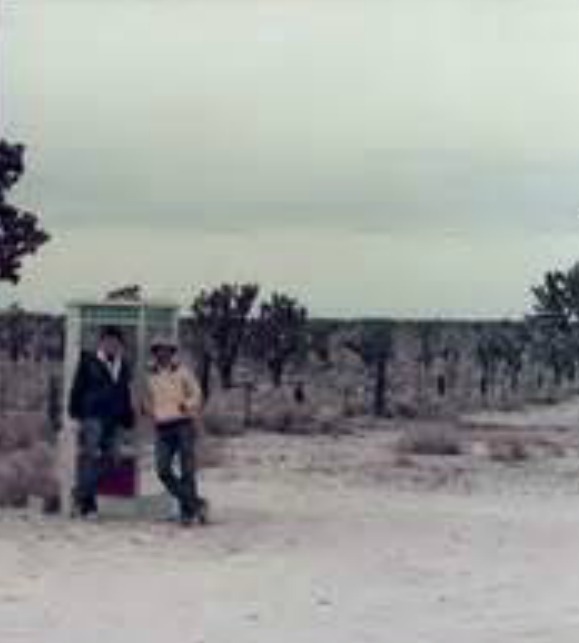 BECAUSE OF ITS ODD LOCATION THE PHONE BOOTH BECAME A PLACE THAT WAS SOUGHT OUT BY THRILL SEEKERS AND SOLO DESERT BIKERS, JEEPSTERS, OR BAJA BUG PEOPLE. ALL KINDS OF STORIES WERE ATTACHED TO THIS DESOLATE LOCATION OR GHOST PHONE. LATER ON, PEOPLE IN STOCK VEHICLES WOULD VISIT THE BOOTH. AS THE WHISPERS ABOUT THIS PHONE SPREAD, OVER THE DECADES PEOPLE IN THE USA AND THEN FROM AROUND THE WORLD WOULD CALL THE PHONE's NUMBER IN HOPES THAT SOMEBODY WAS AT THIS DESOLATE PHONE BOOTH, IF THERE WAS A PICK UP A CONVERSATION WOULD BE HAD. THE VOICE AT THE END OF THE LINE COULD BE ANYBODY. FOR EXAMPLE! 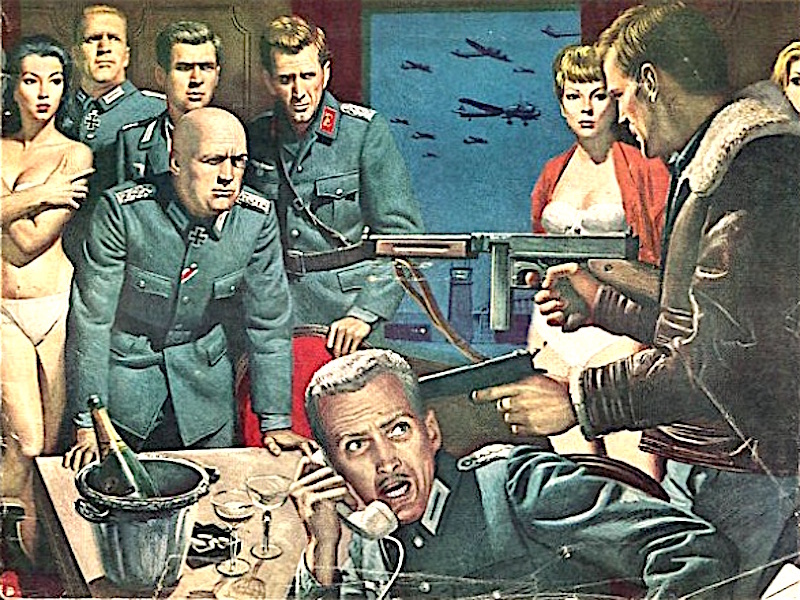 THE LEGENDARY COMMANDER (ZEENO) or ZENO-or-SERGEANT ZENO OR ZENO-- FROM THE PENTAGON OR "PARTS UNKNOWN" WOULD OCCASIONALLY CALL IN AT THE PHONE BOOTH. ZEENO or ZENO in UFO LORE-- was supposedly a A MAN FROM OUTER SPACE WHO MADE CONTACT WITH HUMANS IN THE 1950s AND EARLY 1960s. ZEENO ISSUED WARNINGS ABOUT THE FUTURE AND GAVE A FEW INDIVIDUALS A RIDE IN HIS FLYING SAUCER. 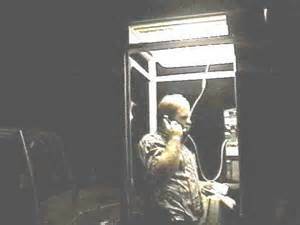 SOME PHONE BOOTH CALLERS - CLAIMED THEY WERE A GHOST OR BEINGS FROM ANOTHER PLANET OR ANOTHER DIMENSION. WERE THEY, I DOUBT IT. AT THE PHONE BOOTH, YOU JUST NEVER KNEW WHO WAS GOING CALL, AT TIMES NOBODY CALLED. BUT IN THE LATE 1990s WITH THE SECRET OUT, THE PHONE DID GET A LOT OF WORK, PEOPLE FROM ALL OVER THE USA AND SOME FROM AROUND THE WORLD WOUDL DIAL IN. 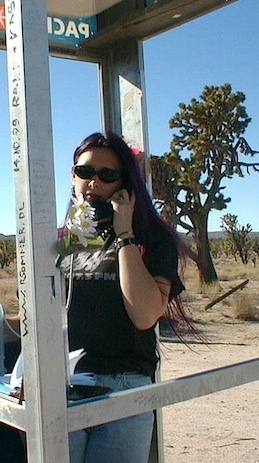 BEFORE THE LATE 1990s THE DESERT SILENCE DAY OR NIGHT WOULD SPORADICALLY BE BROKEN BY THE PHONE RINGING. ON THE OTHER END OF THE DESERT PHONE LINE WOULD BE A PERSON WHO WANTED TO SEE IF SOMEBODY WAS OUT IN THE MIDDLE OF THE MOJAVE AT THE BOOTH. OR AN ODD CHARACTER WOULD CALL IN TO WHAT WAS FOR ALL INTENT -- "THE PHONE AT THE EDGE OF THE WORLD. MANY CALLERS WERE SERIOUS AND WOULD ONE COULD HAVE CONVERSATIONS WITH THEM ---- SOME DIAL INS WERE PRANKSTERS FROM DIFFERENT PIZZA EATERIES------ BE IT CALIFORNIA, UTAH, OR NEVADA. PRIOR TO THE LATE 1990s, CALLERS TO THE BOOTH WERE MAINLY FROM THE USA, BUT THERE WAS ALWAYS THE EXCEPTIONS. A SECURITY GUARD FROM TAIWAN WHO WOULD LAUGH AND SPEAK MAINLY IN CHINESE WAS AN ODD CALLER. MY CONVERSATION WITH THIS GUY WENT NOWHERE, BECAUSE THERE WAS SO LITTLE ONE COULD UNDERSTAND. LIKEWISE, OTHERS WHO TALKED TO HIM, DID NOT SPEAK THE LINGO, BUT THAT CHINAMAN SURE LIKED TO LAUGH. THE FOLLOWING FELLOW WAS AN EXCEPTION BECAUSE MOST PHONE INS, WERE NICE PEOPLE. ONE MAN WHO WHO WAS BLASTED ON BOOZE OR SOMETHING ELSE LABELED HIMSELF "THE (UNINTELLIGIBLE-MUMBLED) HOOSIER" OR "THE HOOSIER". AFTER IDENTIFYING HIMSELF, HE WOULD BOOM OUT "HOW DO YOU LIKE IT! HOW DID YOU LIKE IT!" THE RUDE MAN WOULD THEN NAME A STATE AND START OVER WITH HIS QUESTIONS OR SIMILAR QUESTIONS. THIS MAN WOULD TALK MAYBE 20 SECONDS AND SOMETIMES HE WOULD NAME A HIGHWAY NUMBER AS HE ASKED HIS ODD QUESTIONS. ANYBODY LISTENING TO THIS RUDE MAN WOULD HANG UP AFTER X AMOUNT OF TIME, OR SOMETIMES THE HOOSIER WOULD HANG UP. I GUESS HE WAS SO GONZO HIGH, HE WOULD PRESS THE WRONG BUTTON ON HIS SIDE AND---CLICK. THEN THERE WAS A LADY WHO WOULD CALL IN AND COMPLAIN WHILE TRYING TO GET HELP FOR HER LEAKING WATER SOFTENER UNIT WHICH WAS FLOODING AND DESTROYING HER GARAGE AND YARD…I DO NO KNOW IF SHE WAS ON MEDS OR JUST CONFUSED AND THOUGHT SHE WAS TALKING TO A PERSON WHO WAS TRYING TO FAKE HER OUT THAT SHE WAS TALKING TO HER LOCAL WATER SOFTENER COMPANY. THE ODDITIES WERE THE EXCEPTIONS, MAINLY IT WAS PEOPLE WHO CALLED THE DESERT AND WOULD ASK QUESTIONS ABOUT IS THIS PLACE REALLY A PHONE BOOTH IN THE MIDDLE OF NOTHING? THEN MORE ANSWERS AND QUESTIONS WOULD FOLLOW FO WHO THEY WERE AND WHERE THEY WERE CALLING AT. ONE CHARACTER WHO LIKED TO LAUGH AND HAD LIMITED ENGLISH SKILLS WAS A NIGHTWATCHMAN FROM ECUADOR, WHO WOULD REPEAT THAT (BOSS) SENORITA CARMELITA WAS NOT THERE AT THE PLACE OF BIZ. MAYBE THAT IS WHY HE WAS ON THE PHONE--WHEN THE CAT IS AWAY THE MICE WILL PLAY. I COULD JUST IMAGINE THIS GUY, AS I LISTENED TO HIM A FEW TIMES. 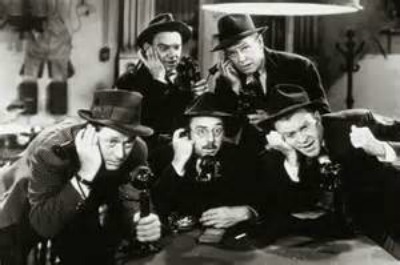 I PICTURED THE CALLER BEING IN AN ELDERLY DARK UNIFORMED MAN, SOMETHING LIKE A 1940s MUSTACHED, BADGED, SKINNY FEDERALE. THE PHONE BOOTH GOT CALLS FROM NICE PEOPLE FROM ALL OVER THE WORLD. CALLS CAME FROM GERMANY, ENGLAND, ALBANIA, CANADA, NEW ZEALAND, AND FRANCE. ONE 84 YEAR OLD WIDOW FROM BOSTON WOULD CALL THE BOOTH DAILY, AND SPEAK TO WHOEVER WAS THERE IF ANYBODY WAS THERE. THIS WIDOW WOULD GET A CHARGE FROM THE THRILL OF PHONING THE EDGE OF THE WORLD. I KIND OF THINK THAT ACTION AND THE ENERGY OF THE BOOTH KEPT THE LADY HAPPY AND ALIVE. LIKEWISE, THE SAME EFFECT APPLIED TO AN ELDERLY CHICAGO WIDOW, THE PHONE BOOTH WAS A TONIC IN SO MANY DIFFERENT WAYS FOR THOSE THAT CALLED IN OR ANSWERED THE RING. 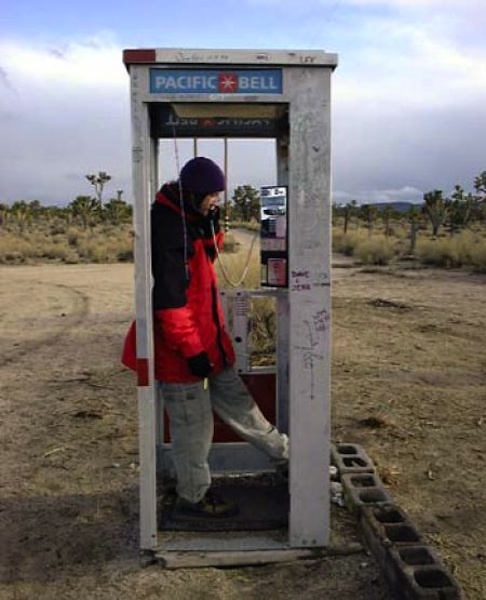 IT SEEMED CALLING THE MOJAVE PHONE BOOTH FROM WHEREVER IN THE WORLD, KEPT MANY PEOPLE, (CALLERS) JAZZED. THIS PHENOMENA EFFECTED: THE SICKLY, THE INJURED, THE ELDERLY, THE CURIOUS, THE ECCENTRIC OR THE HEALTHY. MOST OF THE TIME, THE CONVERSATION WOULD INVIGORATE THE CALLER. 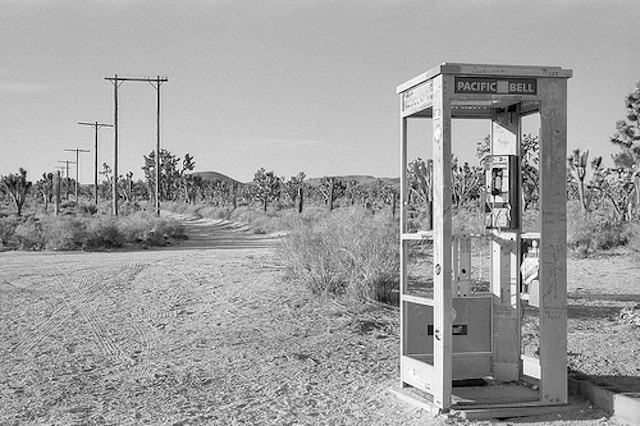 THERE WAS A MAGIC THAT CAME FROM THE MOJAVE PHONE BOOTH. 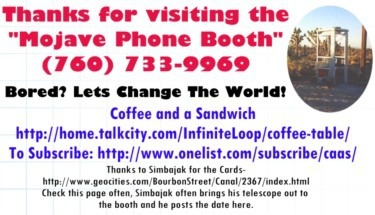 PRIOR TO THE MID 1990s, BEFORE THE BOOTH BECAME KNOWN TO THE WORLD AS WHERE "THE PHONE AT WHERE THE UNIVERSE ENDS". 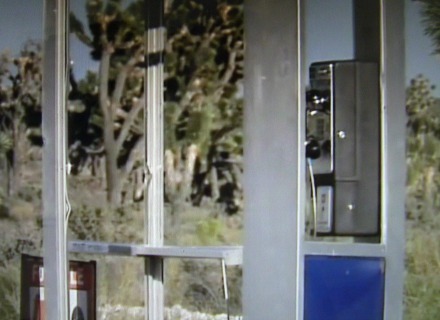 IF YOU CALLED THE MOJAVE PHONE BOOTH, IT WOULD RING AND RING, BECAUSE THERE WOULD BE NO PICK UP. 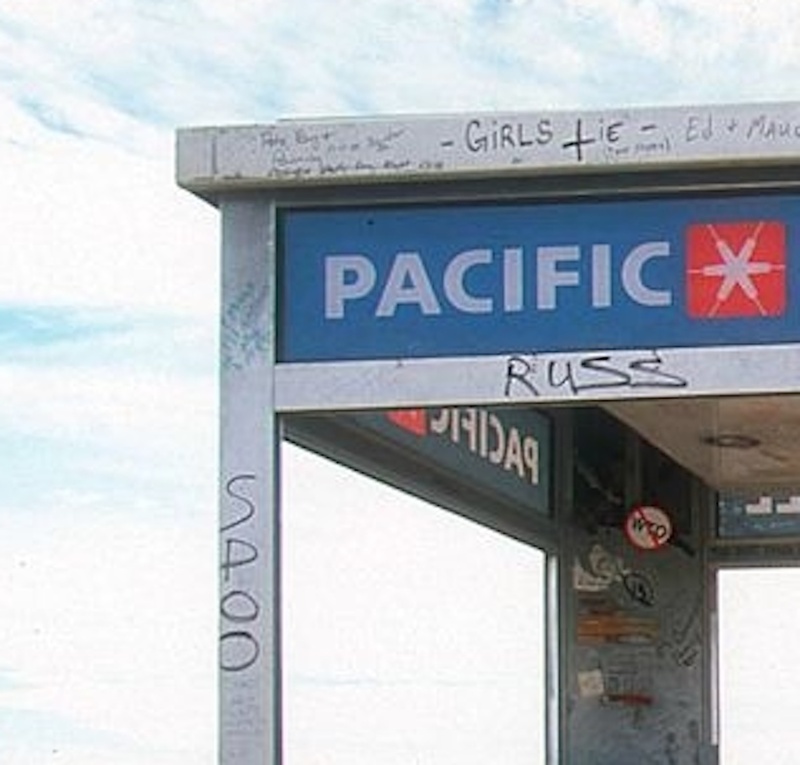 BEFORE THE LATE 1990s, FEW PEOPLE VISITED THE PLACE OR CAMPED OUT AT THE MAGICAL PHONE BOX. 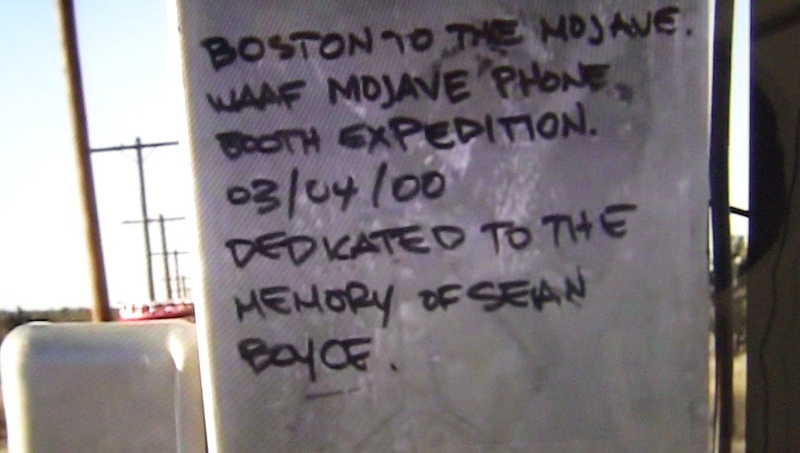 ONCE THE PHONE GOT DISCOVERED, SOME PEOPLE ON A MEMORIAL MISSION WOULD TREK ACROSS THE DESERT AND IN SOME CASE TRAVEL THOUSANDS OF MILES TO THE BOOTH AND LEAVE A MESSAGE FOR THEIR DECEASED LOVED ONE ON THE MPB FRAME. AS ODD AS THIS READS, FOR SOME PEOPLE THE PHONE BOOTH AT THE EDGE OF THE WORLD WAS A PLACE WHERE WISDOM AND HEALING COULD HAPPEN. 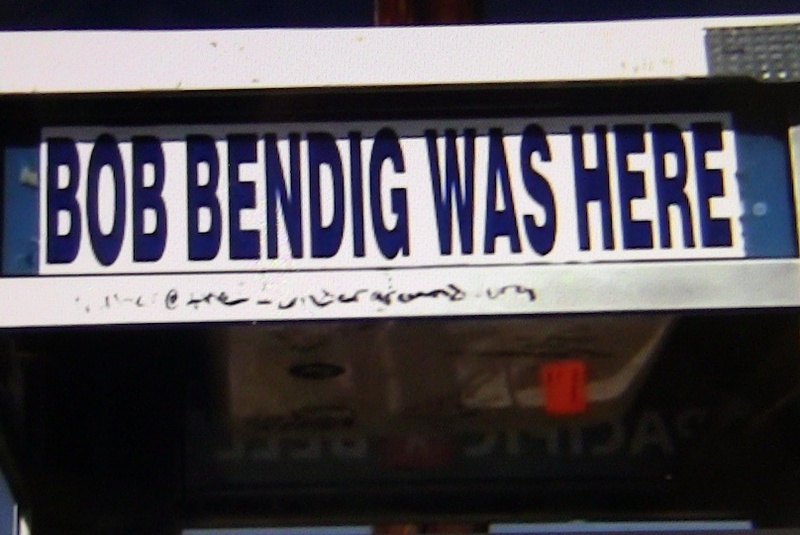 HECK, IF THE PHONE BOOTH WAS STILL THERE, I WOULD BUY A 1967 BONNEVILLE TRIUMPH (PRIMO CONDITION) AND JOURNEY TO THE DESERT AND WRITE THE NAMES OF MY DECEASED SIBLINGS ON THE BOOTH ALONG WITH A MESSAGE. THEY WOULD HAVE LIKED THAT, YES THEY WERE FELLOW EXPLORERS -- DESERT RATS, WHO AGES AGO MADE THE PILGRIMAGE. THEY HAVE PASSED ON SINCE THE BOOTH WAS TAKEN AWAY. MAYBE THE BOOTH's ENERGY OR PART OF IT DERIVED FROM HAVING TO DRIVE OR RIDE (MOTORCYCLE) IN RUGGED TERRAIN TO REACH THE PHONE BOOTH. PERHAPS THE JOURNEY CLEARED THE MIND. FOR MOST PEOPLE THE BOOTH DID NOT EFFECT THEM IN A DEEP WAY. THE TREK WAS JUST PURE ADVENTURE, BUT FOR SOME-- AGAIN-- THERE WAS AN ENERGY THERE. THE PHONE BOOTH WAS THE ORIGINAL "WILD CARD LINE", THIS WAS ESPECIALLY TRUE BEFORE THE MID 1990s. FOR SOME REASON BEFORE THE PHONE WAS DISCOVERED BY THE WORLD, A NUMBER OF ODD ORATORS WITH STRANGE THINGS TO SAY, CALLED THE ISOLATED PHONE. THROUGH THE DECADES THE PHONE BOOTH WAS SHOT UP, IT WAS DECORATED WITH PLASTIC FLOWERS, SPRAYED WITH PAINT, MARKED WITH DECALS AND GIVEN AN ANCIENT WELCOME MAT. CANDLES, CHAIRS, ROSARIES, GRAFFITI, PHONE BOOKS FROM OTHER STATES AND PHOTOS WERE LEFT AT OR ON THE BOOTH. SOMETIMES, EMPTY BEER BOTTLES WERE POSITIONED ON THE MENTAL FRAME. ALL KINDS OF TRIBUTE WAS LEFT AT THIS PHONE BOOTH. OCCASIONALLY COINS, AMERICAN AND FOREIGN COULD BE FOUND IN AND AROUND THE PHONE BOX. WERE THEY DROPPED AT NIGHT BY ACCIDENT IN THE DARK OR JUST LEFT OR THROWN INTO THE CUBICLE AS SOME TYPE OF PRESENT. THE COINS AND TRINKETS THAT WERE LEFT INSIDE THE BOX OR WERE SUPER GLUED TO THE BOOTH, WERE EVENTUALLY TAKEN BY VISITORS OR THE PHONE COPS - BLM!. THE ONLY THING THAT HAD A CHANCE FOR A LONG LIFE AT THE BOOTH WERE DECALS. BUT EVEN THESE, AFTER A WHILE WOULD BE PEALED OFF BY WAY OF HUMANS WITH THE HELP OF THE SUN AND HEAT. IF BY CHANCE THE DECAL ON THE PHONE BOOTH WAS UNTOUCHED BY HUMAN HANDS, IN TIME IT WOULD STILL PEEL OFF. DUE TO THE EFFECTS OF THE DESERT WIND AND THE HEAT. RARELY WOULD ONE FIND THE BOOTH CLEAN OF WRITING OR OF DECALS. WHEN THE BOOTH WAS FOUND IN A PRISTINE CONDITION, IT WAS DUE TO A COMBINATION EVENTS: RAINSTORM OR VISITORS WHO DETAILED THE PHONE BOX. CLOUD BURST DID HAPPEN IN THE DESERT, THEY WERE RARE BUT WHEN THEY DID HAPPEN, AND THE PHONE BOX GOT RAINED ON, A LOT OF THE INK ON THE CUBICLE WOULD BE WASHED OFF ALONG WITH WEATHERED DECALS. ALSO, SOME PILGRIMS WHEN THEY VISITED THE BOOTH WOULD CLEAN UP THE BOX AND SCRUB THE BOOTH's FRAME. THE MESSAGES THAT PREVIOUS PIONEERS HAD LEFT, WOULD BE NO MORE. RATHER LIKE LIFE, HERE FOR X AMOUNT OF TIME, THEN ADIOS EL MUNDO. ALSO-- THE INTENSE SUNLIGHT AT THE BOOTH WOULD IN TIME MAKE THE GRAFFITI FADE AWAY. MOST CLEAN UPS AT THE BOOTH CONSISTED OF SWEEPING OR A DUST OFF OF THE BOOTH AND THEN LEAVING A ICON ON THE FRAME OR SOME SCRIBBLE. 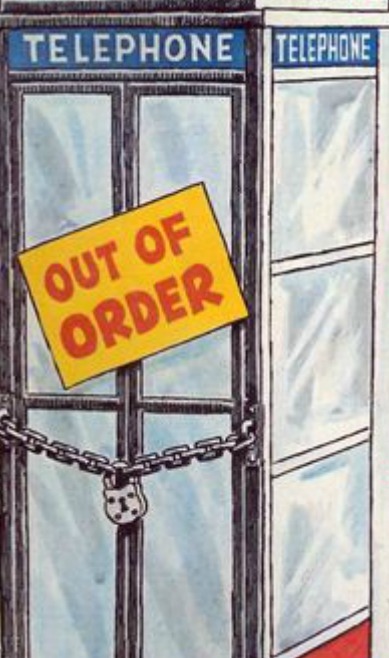 MOST OF THE NICK-NACKS LEFT BY THE ICONOCLASTS AT THE PHONE BOOTH WERE TAKEN BY OTHER VISITORS AT A LATER DATE. 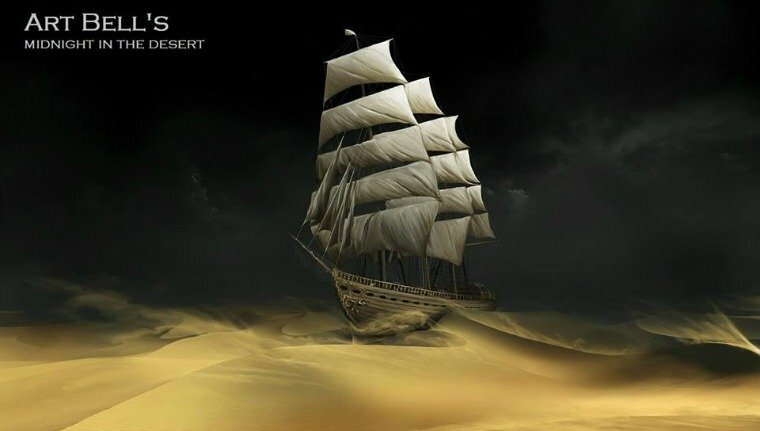 OR THE DESERT WIND SWEPT THE OFFERINGS AWAY. NOTICE IN SOME OF THE SNAPSHOTS -- HOW CLEAN THAT FRAME BEAMS ARE. SOMEBODY SCRUBBED THE METAL BEAMS OR BEAM WITH WINDEX AND A PAPER TOWEL. THE SEARING MOJAVE SUN ALSO MADE FOR THE FADING OUT OF THE TAGGING. THE PHONE's TELEPHONE FIRST NUMBER WAS 714-733-9969, SOME WEIRD BEARDS ATTESTED THAT THE DIGITS WERE SOMEHOW LINKED TO THE NUMBER OF THE BEAST. THE LIES AND MYTHS THAT ATTACHED THEMSELVES TO THE BOOTH WERE THAT DIFFERENT CULTS CAME TO THE PHONE BOOTH AND SO DID THE CHARLES MANSON FAMILY IN THE 1960s. AS FAR AS I KNOW, NOBODY WAS FOUND DEAD AT THIS PLACE OR OUT IN THE WEEDS NEARBY THE BOOTH. IF CULTS DID COME TO THIS PLACE, AND MAYBE THEY DID, THE BOOTH REMAINED AND THEY LEFT. THERE WERE A FEW PEOPLE WHO VISITED THE BOOTH BECAUSE THEY CLAIMED SOMETHING DIVINE TOLD THEM TO. 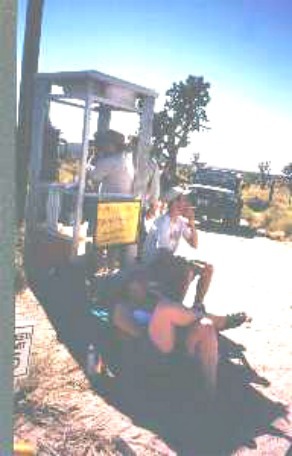 THESE PEOPLE CAME BY THEMSELVES TO THE MOHAVE PHONE BOOTH, THEY TENDED TO BE VERY QUIET. THEIR SOLITUDE AND ENERGY THAT RADIATED FROM THEM WAS A BIT CREEPY. THEIR MINDS WERE ON A DIFFERENT WAVE LENGTH, AS FAR AS EVERYBODY COULD TELL, THEY WERE NOT- NOT- NOT SERIAL KILLERS LOOKING FOR BLOOD. SIMPLY PUT, THESE NOT BOTHERING VISITORS, PERHAPS HAD A PARTIAL SCITZO PERSONALITY AND WERE IN NEED OF MENTAL THERAPY. IN ANY EVENT, THESE PEOPLE's MINDS WORKED COMPLETELY DIFFERENT FROM THE MODERN AMERICAN GRAY MATTER MODEL. THESE QUIET PEOPLE WHO WERE ON A MISSION (DIVINELY INSPIRED THEY CLAIMED OR JUST FLAT OUT HEARD VOICES) STAYED A BIT AT THE PHONE BOOTH, MAINLY IN THEIR VEHICLE AND THEN LEFT. ONE LADY ON A QUEST, WAS A PETITE, STRONG DARK TAN LATINA WHO HAD AN UNNERVING CALM ENERGY ABOUT HER. THIS AURA WAS NOT DRUG INDUCED, IT SEEMED HER BRAIN FIRED DIFFERENTLY AS COMPARED TO THE REST OF THE HUMAN HERD. ANOTHER TRAVELER WAS A VERY OLD RETIRED ALCOHOLIC MAN. THIS MATURE ANGLO SAXON WORE A BASEBALL CAP AND THOUGHT HIS TIME ON EARTH WAS NEARLY UP. THIS MAN TOLD ME, THE PLACE GAVE HIM COMFORT. ONE GUY--- THAT GAVE EVERYBODY BAD VIBES AND I DARE SAY NOT JUST AT THE PHONE BOOTH, BUT WHERE EVER HE DROPPED ANCHOR AT, WAS A (NO NAME) SKINNY MAN, LONGISH HAIR, LATE 20s, ANGLO-SAXON. THIS MAN HAD AN EVIL ENERGY ABOUT HIM THAT WAS BEYOND BELIEF. YOU WOULD NOT WANT TO TURN YOUR BACK ON THIS GUY. THE NEGATIVE AROUD THIS FELLOW WAS NOT CAMOUFLAGED. I WOULD NOT HAVE WANTED TO GO TO SLEEP IN A TENT OR A LOCKED UP CAR IF THIS YOUNG MAN WAS AROUND, BECAUSE YOU WON't WAKE UP. I HOPE THIS MAN FOUND GOD, AND CHANGED HIS VIBE. THE GUY CAME AND LEFT (DAYTIME), IF I REMEMBER CORRECTLY HE WAS HEADED FOR LANCASTER OR L.A? IN MANY WAYS HE WAS A TRAGIC, SAD CASE. WHO KNOWS WHO HE PHONED (ANOTHER EVIL PERSON) OR WHAT WAS IN HIS QUASI SEA BAG? ("BRING ME THE HEAD OF ALFREDO GARCIA" A SAM PECKINPAU FILM COMES TO MIND)! HOWEVER! 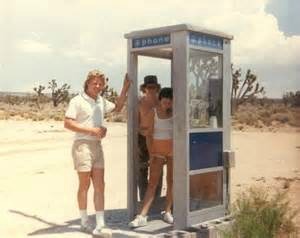 MOST PEOPLE, %98 PERCENT OF THE MOJAVE PHONE BOOTH VISITORS-- WERE JUST REGULAR PEOPLE WHO IN ESSENCE WERE "OFF TO SEE THE WIZARD OF OZ" OR "OFF TO SEE THE EMERALD CITY". THE PHONE BEING THE SPECIAL THING THAT HAD TO BE SEEN. MAINLY YOUNG AMERICANS WENT TO THE PHONE BOOTH. AFTER READING ABOUT THE MPB IN MAGAZINES OR ON THE INTERNET. THE PHONE BOOTH BECAME A 1969 WOODSTOCK-ESQUE LANDMARK, AS IN--- I WAS THERE, I SAW IT, I TALKED ON IT. THE MPB's AREA CODE WAS LATER CHANGED TO 619 AND THEN TO 760. SADLY THE PHONE BOOTH WAS REMOVED MAY 17, 2000. THE TREE HUGGERS WERE RIGHT WHEN IT CAME TO THE LANDSCAPE AROUND THE MPB BEING ALTERED, AS IN HUMANS KILL WEEDS. IT IS A FACT THAT THE AREA AROUND THE TELEPHONE BOX HAD BEEN WIDENED DUE TO THE LANDMARK's MANY VISITORS. TO THE CHAGRIN OF THE NATURE FREAKS, MANKIND WAS TRIUMPHING OVER THE SCRUBS. DEPENDING ON WHAT YEARS A PERSON WENT TO THE BOOTH, THEY WOULD FIND THAT THE PHONE BOOTH HAD OR DID NOT HAVE AN ELECTRIC LIGHT THAT WORKED. THE REASON: THE CUBICLE's LIGHTS HAD BEEN SMASHED OR PILGRIMS HAD INSTALLED NEW ONES. SOME BRAINIACS ON THEIR VISITS HAD GOT THE POWER RUNNING INTO THE BOOTH AND INSTALLED OUTLETS FOR LIGHTS, THE JUICE CAME VIA THE MAIN WIRE. 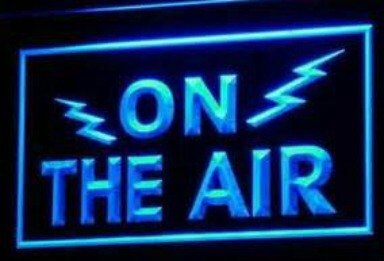 OR BY WAY OF AN CAR ENGINE's INVERTER (CONVERTER, A CHORD WENT INTO THE BOOTH, VOILA, THERE WAS LIGHT AT NIGHT! COURTESY OF A CAR ENGINE AND ITS NON STOCK GADGET POWER BOX. MOST OF THE TIME- THE PHONE BOOTH WAS LIT BY YOUR OWN BATTERY OPERATED ITEMS. 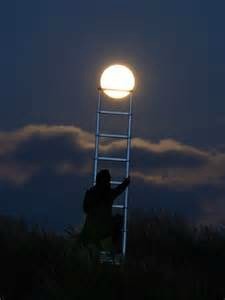 SOMETIMES A LANTERN OR A CANDLE WOULD BE LEFT BEHIND BY SOME GOOD SAMARITAN. THERE IS ONE GUY ON THIS PLANET WHO "DIGS" THE MPB AS MUCH AS I DO = DOC DANIELS - HE IS DOING A BOOK ON THE PHONE BOOTH = HERE IS HIS KICKSTARTER PAGE -- HELP HIM OUT. MORE ON DOC, AKA "CHRISTOPHER COLUMBUS" FARTHER DOWN. INTHE PAST-- PEOPLE HAVE BEEN CONFUSED BY TO MANY LINKS-- DOC HAS ONE LINK NEAR THE BOTTOM OF THE PAGE-- NO EXCUSES-- HELP FUND THE MPB PROJECT! AROUND 1979 TO 1984 THE FIRST BOOM IN VISITS TO THE BOOTH HAPPENED--- THIS WAS DUE TO AN ARTICLE THAT WAS WRITEN ABOUT THE BOOTH AND WAS NOW AND THEN REPRINTED AS FILLER IN NEVADA AND CALIFORNIA NEWSPAPERS. IN THE MID TO LATE 1990s THE NEXT VISITOR BOOM HAPPENED. WITH THE ADVENT OF INTERNET -- THE TELEPHONE BOOTH BECAME THE PLACE TO SEE. ALSO, CIVILIZATION WAS GETTING CLOSER TO THE MPB. IN THE 1990s ONE COULD SEE FROM THE DESERT PHONE BOOTH AREA SOME FAR OFF HOUSES THAT SAT IN THE DISTANT HILLS. THESE OR SOME OF THESE BUILDINGS HAD NOT BEEN THERE DECADES BEFORE. 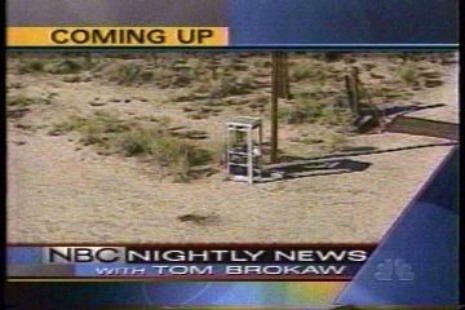 NEAR THE TURN OF THE CENTURY, NBC NIGHTLY NEWS WITH TOM BROKAW DID A REPORT ON THE BOOTH. A REPORTER WENT TO THE MPB AND DID A SEGMENT FOR A BROADCAST THAT WAS SEEN AROUND THE USA. THE TELEPHONE BOX WAS BECOMING POPULAR, (PROOF OF THAT) THE HIGH SHERIFFS AT NBC IN NEW YORK HAD NOW HEARD ABOUT IT. IN ANY CASE FROM 1970 ONWARD A FEW TREE HUGGERS DID NOT LIKE THE IDEA OF PEOPLE DRIVING OUT INTO THE DESERT AND CAMPING AT THE PHONE BOOTH OR STAYING THE DAY OR EVEN A FEW HOURS THERE. THE SAND AND SCORPION LOVERS COMPLAINED ABOUT HOW NATURE WAS BEING INFRINGED UPON. THESE NATURE BOLSHEVIKS AND THERE CADRE GREW. IN THE EARLY 1970s THESE FRIENDS OF THE SAND HAD STOPPED DESERT RACES OR OFF ROADING IN MANY EMPTY SCRUBLAND AREAS OF NEVADA, CALIFORNIA, ARIZONA, & NEW MEXICO. HERE IS AN ARCHETYPICAL EXAMPLE OF THESE VENOMOUS SELFISH, STUPID NATURE NAZIS. I MET ONE OF THESE NATURE FANATICS == A MRS. CAROLYN P-----S. WHO WAS A COLORADO TRANSPLANT. THIS LADY HAD BEEN AN ELEMENTARY TEACHER (POOR KIDS) AND HAD MANY LITTLE SAYINGS -- ONE IN PARTICULAR -- A SONG SHE WOULD SING-- AND I ONLY REMEMBER THE CATCH PHRASE:" I HAVE NEVER SEEN A ROAD SIGN AS PRETTY AS A TREE". 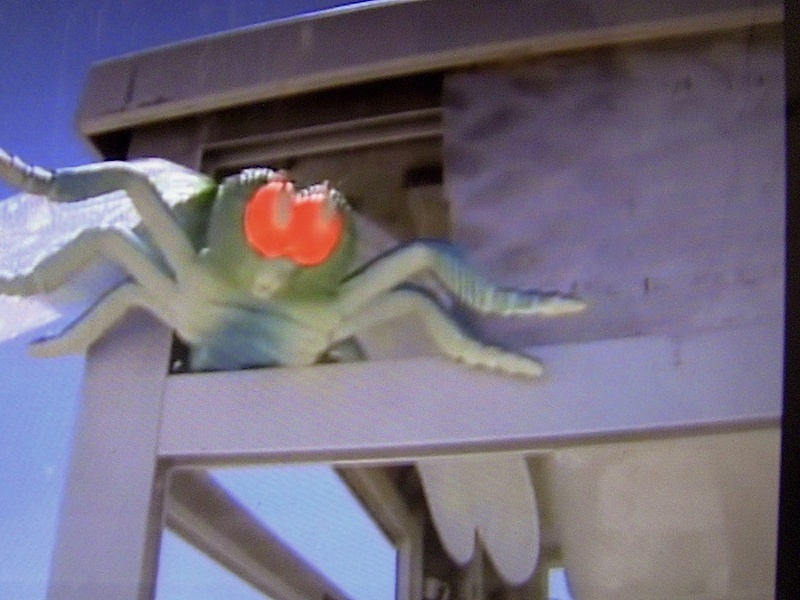 ONE TIME I MENTIONED TO THIS MONSTER, I LIKED THE OLD BURMA SHAVE BILLBOARDS, THEY HAD CREATIVE JINGLES. I THEN GOT A LASER BLAST STARE OF DISDAIN FROM THIS CIGARETTE SMOKING, MONEY GRUBBING FREAK. AT TIMES THIS WITCH WOULD MUMBLE SOMETHING ABOUT MOTORCYCLE POLLUTION AND THE POPULATION EXPLOSION. LATER I FOUND, ALL OF HER SAVE THE LANDSCAPE IDEALS WENT OUT THE WINDOW WHEN SHE COULD MAKE MONEY. THIS NATURE FANATIC WAS A TEACHER IN WORD ONLY, SHE WOULD PRETEND TO DO THE WORK OF AN EDUCATOR TO GET A PENSION. APPARENTLY THIS LADY LIKED FLUNKING ELEMENTARY KIDS THAT DID NOT GO ALONG WITH HER CLASSROOM IDEAS ON HOW BAD TECHNOLOGY OR OFF ROAD VEHICLES WERE. 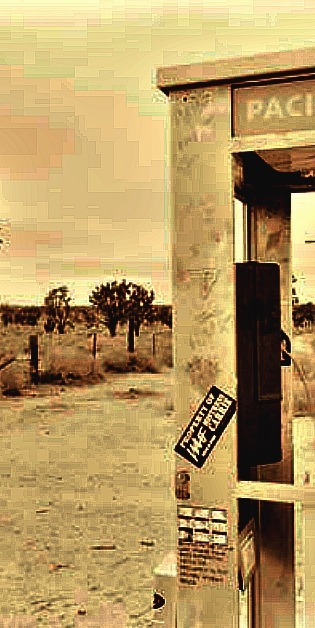 BELOW: After the Mojave PHone Booth was taken away, a message was written on the sign. In essence saying the eco warriors were right. NO THE TREE HUGGERS WERE IN THE WRONG! BELOW: The Booth is gone and age + weather have corroded the sign. THIS MONSTER WOMAN, TOOK HER TREE HUGGER VIEWS FROM HER CLASSROOM TO THE CONSERVATION GROUPS THAT HAD THE IDEOLOGY = ANYTHING OUTSIDE OF A TOWN IS OFF LIMITS TO HUMANS. HOWEVER--THIS STUBBORN-BLOODLESS WOMAN WHILE SHE WAS A TEACHER AND THEN IN HER RETIREMENT WAS A CAPITALIST WHO MADE MONEY OFF OF LAND SPECULATION AND THE BULLDOZING OF UNSPOILED LAND FOR DEVELOPMENT. BUT EVERYTHING ELSE THAT DID NOT MAKE MRS. P_____S. AND HER HUSBAND PROFIT WAS FORBOTEN TO THE PUBLIC! THIS HYPOCRITE LADY AND HER RADICAL PALS WERE ABLE TO SWAY THE AUTHORITIES IN WHAT WAS NOT ALLOWED TO BE HIKED OR DRIVEN ON. YET WITH HER UNSCATHED LAND HOLDINGS, THIS OGRE AND HUSBAND WOULD BULLDOZE HER LARGE PROPERTIES AND HAVE THEM DEVELOPED. SHE WOULD HAVE DONE THE SAME TO THE MPB IF SHE COULD HAVE MADE MONEY OFF OF A DEVELOPMENT. MRS. P_____S AND OTHERS LIKE HER -- MADE A LOT OF NOISE ABOUT PLACES THAT WERE OUT IN THE WILDS THAT WOULD GET VISITED BY HIKERS OR BIKERS. AS STATED BEFORE THIS "EARTH-DAY" ZEALOT WAS ANTI - ANTI - ANTI HUMANS IN THE WILDS. UNLESS, HUMANS IN THE WILDERNESS HELPED HER BANK ACCOUNT. SOMEHOW-- RIDING A MOTORCYCLE OR GOING OFF ROAD IN A 4 WHEEL VEHICLE WAS A VERY BAD THING TO DO. BUT THIS HYDRA WOULD SAY NOTHING ABOUT HER BUSINESS DEALINGS, WHICH WAS REAL ESTATE DEVELOPMENT. THESE TYPE OF PEOPLE LIKE MRS. P_____S WOOFED ABOUT PEOPLE VISITING THE MOJAVE PHONE BOOTH. PEOPLE WITH HER MINDSET, MAINLY HUMANISTS GOT THE NATIONAL PARK SERVICE (BLM) TO DECLARE THE PHONE BOOTH A "NUISANCE ATTRACTION". ADDING TO THE RADICAL ROCK PILE LOVERS FIRE, WAS THAT SOME DESERT LOCALS DID NOT LIKE THE AMOUNT OF SEARCHERS THAT WERE SEEN GRAILING FOR THE BOOTH IN THE DESERT. 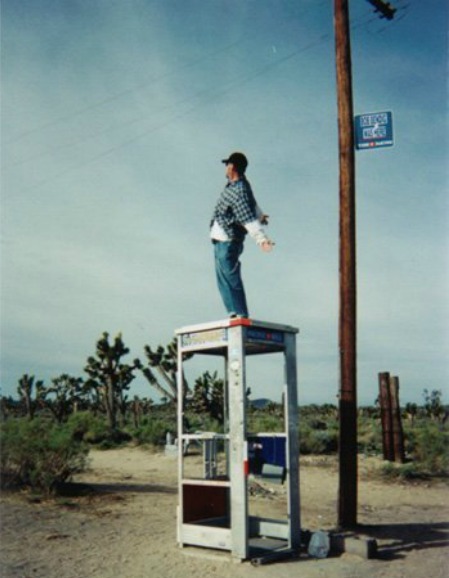 IT WAS BANDIED ABOUT BY THE "DESERT IS OFF LIMITS" CROWD, THAT THE PHONE BOX BROUGHT DRUGGIES AND NO LIMITS PEOPLE TO THE AREA AROUND THE MOJAVE PHONE BOOTH. YES, CAMPOUTS HAPPENED AT THE MOJAVE PHONE BOOTH, BUT REAL VIOLENCE, AS IN WHAT TOOK PLACE AT ALTAMONT, CALIFORNIA CONCERT IN 1969, DID NOT HAPPEN AT THE MOHAVE PHONE BOX. RIOTS THAT SWEPT THE USA IN THE 1960s THROUGH THE EARLY 1970s -- DID NOT - NOT - NOT OCCUR AT THE MPB. SOME LOCALS AND THE NATURE FANATICS -- ARGUED TO THE AUTHORITIES, THAT VISITORS TO THE PHONE BOOTH LEFT TRASH AND THE GARBAGE BLEW OVER THE DESERT INTO PRIVATE PROPERTY. THESE NATUR NAZIS ALSO CLAIMED THAT ABANDONED CAMPFIRES AT THE SITE WERE A PROBLEM. THERE WERE BONFIRES AND CAMPFIRES AT THE DESERT PHONE CUBICLE, BUT WERE THERE EVERY WILD BRUSH FIRES OR ABANDONED FIRES AT THE SITE? I KNOW OF NONE. ONE STORY HAS IT THAT ONE ABANDONED FIRE BURNED ACRES AND ACRES OF DESERT SHRUBS DURING DAYLIGHT HOURS. I DO NOT KNOW IF THIS IS TALE IS FACT OR FICTION? I WOULD THINK IT IS EXAGGERATION. FOR THESE REASONS, MRS P._____S' KIND WON THE DAY --- THE PHONE BOOTH WAS TAKEN AWAY. MORE LAND WAS FENCED OFF AND THE WILDS WERE FORBIDDEN TO BE DRIVEN ON. BUT LAND SPECULATORS LIKE MRS. P._____S, COULD BUY PROPERTY AND THEN TURN THERE ACREAGE INTO HOUSING TRACTS WITH NO THOUGHT TO FLOOD CONTROL. THE WRONG PEOPLE CARRIED THE DAY. ADIOS DESERT PHONE BOOTH. HOWEVER --- THAT MAGICAL PLACE AND PLACES LIKE THE PHONE BOOTH -- STILL LIVES IN THE MINDS OF THOSE THAT APPRECIATED OR VISITED THAT TRACT OVER THE DECADES. 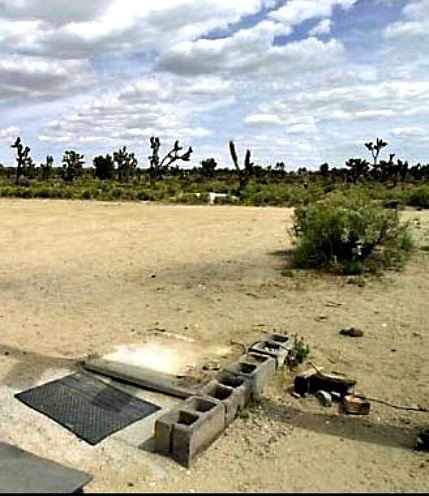 IT IS OF NOTE THAT SOME MOJAVE LOCALS DID NOT AGREE WITH THE NATIONAL PARK SERVICE (BLM) OR PACIFIC BELL's DECISION OF REMOVING THE PHONE BOOTH. 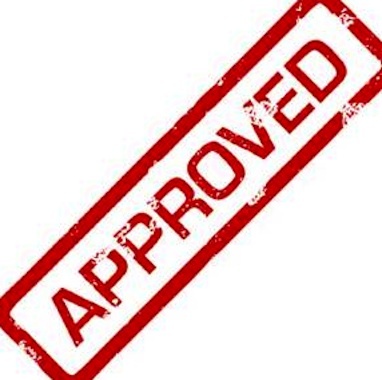 FOR EXAMPLE, TERRY AND LORENE CAFFEE, WHO OWN THE NEARBY CIMA CINDER MINE WERE %100 AGAINST THE BUREA of LAND MANAGEMENT's OR NATIONAL PARK SERVICE DECISION. TERRY SAID, "THEY DON"T WANT PEOPLE OUT HERE UNLESS THEY CAN CONTROL THEM." LORENE ECHOED THAT IDEA BY SAYING, "IT STINKS. THERE IS ABSOLUTELY NO REASON FOR IT. ISN'T THAT WHAT A PARK IS FOR, FOR PEOPLE TO VISIT? IT ISN'T RIGHT THE PARK SERVICE SHOULD NOT BE ALLOWED TO DO THIS, IT's NOT RIGHT." IN THE 1960s AND 1970s, THERE WERE LESS ROADS OR PATHS, AND THIS AREA WAS VERY DESOLATE. ON THIS WEBPAGE: NOTE HOW THE POWER LINES, POLES AND PHONE BOOTH AREA CHANGED THROUGH THE YEARS. THE PATH TO THE PHONE BOOTH BECAME LESS WILD, DUE TO THE SEARCHERS -"GRAILERS". HOWEVER ONE AREA OF SANDY ROAD TO THE MPB BECAME MORE TREACHEROUS DUE TO THE TRAFFIC LOOSING UP THE HARDENED SAND. IN REALITY THERE WAS NOT MUCH OFFROAD 4 WHEEL EXPLORATION IN THE LAND AROUND THE PHONE BOOTH. THE TERRAIN COULD BE RUGGED AND ONE DID NOT WANT TO BREAK AN AXLE. BY THE LATE 1990s ACCORDING TO SOME -- PERHAPS 25-30 PEOPLE A WEEK WOULD GO TO THE PHONE BOOTH. CORRECT, HIGH, LOW? DURING MY PREHISTORIC DESERT SAFARIS I ALMOST NEVER SAW ANYBODY ON THE DESERT ROADS OR OUT IN THE WILDS. WHAT WAS SEEN OUT THERE OR AT THE MPB WAS SMALL LEFT BEHIND SIGNS-BE IT ON WEATHERED PAPER, MESSAGE IN A BOTTLE OR GRAFFITI AND AT TIMES A PILE OF DIRECTION ROCKS . LEFT MAPS-- DO NOT BE FOOLED -- A LOT OF THE ROADS OFF OF THE INTERSTATE ARE BUMPY LANES OR POWER LINE TRAILS. 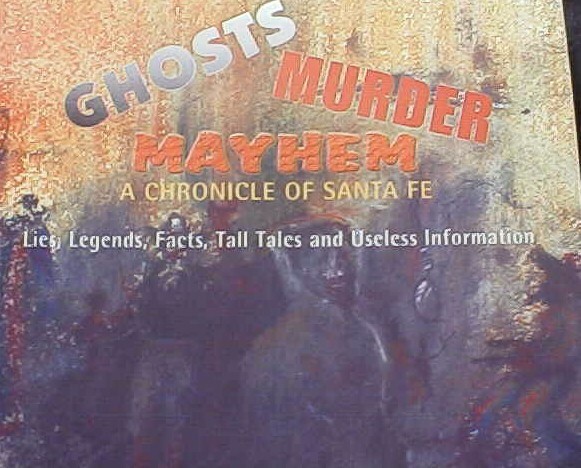 IF YOU LIKE THIS KIND OF LORE, SCHEDULE A TOUR WITH ALLAN, HIS PRIVATE TOURS ARE FILLED WITH SANTA FE YARNS AND TALES THAT ARE SIMILAR IN THEME TO THE MPB SAGA. 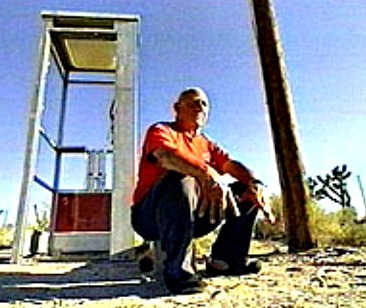 BELOW: "THE MOST INTERESTING MAN IN THE WORLD" called the Mojave Phone Booth and then visited it. WHY? Because it was interesting! 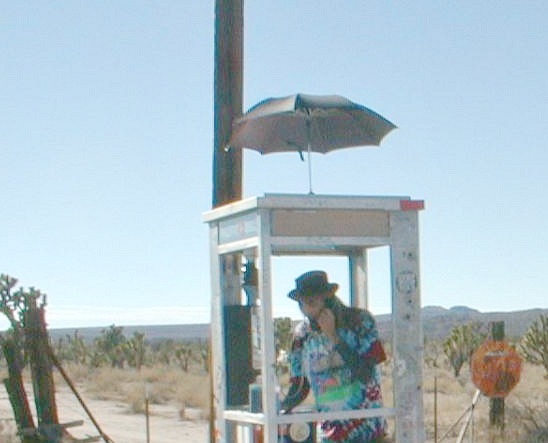 BACK TO THE MAGICAL DESERT PHONE BOOTH! NOTE THE PINK FLAMINGO AT THE PHONE BOOTH---LATER ON SOMEBODY PUT THE PLASTIC BIRD ATOP THE NEAREST POWER POLE. IT IS ALLEGED, IN THE EARLY 1970s SOMEBODY LEFT SOME PLASTIC PINK FLAMINGOS AT THE HAUNTED PHONE BOOTH. HOW MANY WERE PLACED THERE IS OPEN TO SPECULATIONS. WHAT BECAME OF THEM-- THE WIND BLEW THE BIRDS AWAY OR THE FOWL WERE TAKEN AS SOUVENIRS? OTHER PINK FLAMINGOS IN PAIRS OR SOLO WERE LEFT AT THE PHONE BOOTH IN THE 90s. THE ODD THING ABOUT THIS PLACE, IS THAT BESIDE THINGS BEING LEFT THERE, PEOPLE WOULD TAKE MEMENTOS WITH THEM FROM THE PHONE BOOTH. THE PUMICE BLOCKS AROUND THE BOOTH WERE TAKEN, REPLACED BY THE PHONE REPAIR CREW AND TAKEN AGAIN. A FENCE WITH THICK WOODEN POSTS NEAR THE PHONE BOOTH, HAD IN PLACES THE WIRE CUT FROM IT AND SOME OF THE TIMBERS WERE CHOPPED. AT LEAST 2 HUGE LOG CHUNKS WERE USED FOR A LARGE CAMPFIRE. I DID NOT DO IT!! WHAT IS THE STATUETTE OF LIMITATIONS FOR HAVING A COOKOUT, WITH MATERIEL THAT WAS LEFT BEHIND BY PREVIOUS EXPLORERS, AS IN IN WOODEN LOGS? MY STATEMENT TO THE PHONE COPS & THE MODERN DAY "BIG BROTHER" IS , "DUDE WHERE IS MY CONSTITUTION". MY LEGAL ALIBI THAT GETS ME OUT OF TROUBLE FOR ALL THINGS DONE AT THE PHONE BOOTH --IS -------- = "I KNOW NOTHING, I SEE NOTHING, I WAS NEVER AT THE BOOTH, I WAS NEVER IN THE DESERT, I NEVER RODE A MOTORCYCLE, I DO NOT KNOW WHAT A MOTORCYCLE IS, I AM A CYBORG THAT WAS MANUFACTURED IN 2013, SO I COULD NOT BE IN THE DESERT WHEN THE PHONE WAS AROUND!" (WINK-WINK). FURTHERMORE, "ALL THAT IS ON THESE PAGES INVOLVING ME IS TALL TALES AND LIES, OR THE PHOTOS OF ME AND ALL THE SNAPSHOTS OF THE MOJAVE PHONE BOOTH ARE AN ILLUSION!" THE LAST OPTION ABOUT DEEDS AT THE MOJAVE PHONE BOOTH = "I TAKE THE 5TH AMENDMENT!" THAT SHOULD SAVE MY HIDE FROM THE NATURE BOLSHES AND THEIR ILK. 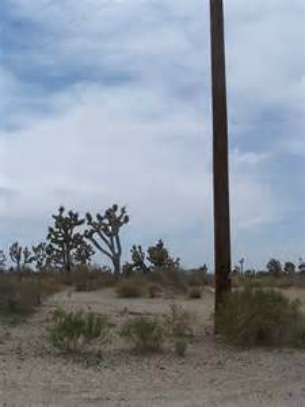 NOW BACK TO PHONE BOOTH LORE --- WHAT WAS LEFT OF THE BURNED WOODEN POSTS AT THE MOJAVE PHONE BOOTH, AND A LOT WAS LEFT, WAS APPARENTLY EXTINGUISHED AT DAWN. OTHER NIGHT TIME VISITORS OR CAMPERS FIRED THE REMAINS OF THE WOODEN PILARS WHEN THEY GOT TO THE PHONE BOX, THESE COOKOUTS WERE BY WAY OF DIFFERENT EXPLORERS AND DIFFERENT EXPEDITIONS. FROM THE EVIDENCE AT THE FIRE PIT, THE TIMBERS TOOK FOREVER TO BURN. ICONOCLASTS BROUGHT SIGNS, STOP & YIELD AND HOME MADE BANNERS TO THIS SHRINE AND LEFT THEM. SOME SIGNS LEFT AT THE BOOTH WERE PAINTED OVER WITH NEW MESSAGES AND THEN LATER, TAKEN BY OTHER VISITORS. ONE STOP SIGN AND MA BELL PLACARD WITH GRAFFITI DID MANAGE TO STAY AT THIS PLACE FOR SOMETIME BEFORE THEY DISAPPEARED. ANOTHER STRANGE THING, IS THAT THE AREA AROUND THE PHONE BOOTH WAS INFESTED WITH SIDEWINDERS AND (DIAMONDBACK) RATTLESNAKES. YET I NEVER HEARD OR READ A REPORT OF ANYBODY GETTING BITTEN BY A POISONOUS SNAKE AT THIS PLACE. YET THIS BOOTH COULD PROVIDED SHADE FOR REPTILES DURING SUMMER DAYS WHEN THE TEMPERATURE WAS WELL OVER A HUNDRED DEGREES. I REMEMBER ONE AUGUST, THE TEMPERATURE IN THIS DESERT WAS 115 DEGREES AND THERE I WAS ON MY WAY TO THE MAGIC SPOT! DEPENDING ON WHAT YEAR YOU WENT TO THE BOOTH, THE LIGHT INSIDE THE CUBICLE WORKED OR WAS DESTROYED. IN THE LAST DECADE AND A HALF OF THE BOOTH's LIFE TIME -- GROUPS OF PEOPLE WOULD FIND THE PLACE AND THEN CAMPOUT AROUND THE STRUCTURE IN SLEEPING BAGS OR BEACH CHAIR RECLINERS. BUT NO BITES FROM SNAKES! THE PLACE WAS ENCHANTED! AND REMEMBER, THIS IS THE ERA WHERE THE LIGHT INSIDE THE BOOTH FOR THE MOST PART DID NOT WORK, UNLESS YOU WERE THERE WITH THE RIGHT EQUIPMENT, MORE ON THAT LATER. IN THE LATE 1990s, SPENT CANDLES WERE NOW AND THEN FOUND IN AND AROUND THE PHONE BOOTH. MAYBE SOME OF THE CANDLES WERE PART OF SOME EVIL CEREMONY, GASP! I THOUGHT MOST OF THE CANDLES WERE WHAT WAS LEFT BEHIND BY (NON EVIL) PEOPLE WHO CAMPED OUT BY THE BOOTH. THESE ADVENTURERS NEEDED LIGHT WHILE MANING THE PHONE BOX. I SAW OR RAN INTO A FEW OF THESE HARDY SOULS, THESE DAY & NIGHT ADVENTURERS WERE FROM ALL OVER THE USA. ONE NOTABLE GROUP OF GOOD GUYS WERE FROM OHIO (CLEVELAND). THE LEADER OF THE FOURSOME LOOKED LIKE A NFL FULLBACK, HE HAD NO NECK, HE WAS BUILT LIKE AN OLD FASHIONED COCA COLA MACHINE. THIS YOUNG MAN WAS A VERY GRACIOUS, HAPPY FELLOW. THE GROUP HAD MANY LARGE ICE FILLED COOLERS THAT SEEMED TO CONTAIN AN ENDLESS SUPPLY OF BEER. THESE PROUD IRISH AMERICANS WERE VERY GENEROUS, AS IN HAVE ANOTHER BEER. ALL I HAVE TO SAY ABOUT THAT, "LONG LIVE THE IRISH"! COLD BEER IN THE DESERT, "DIG IT"! 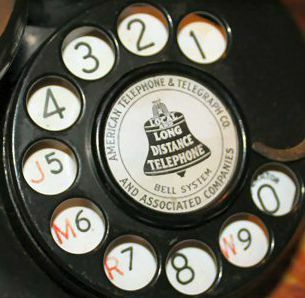 IF ONE VISITED THE BOOTH AT NIGHT OR STAYED THEIR TILL NIGHTFALL, THIS WAS YEARS BEFORE THE PHONE TELEPHONE NUMBER WAS THOROUGHLY DISCOVERED BY THE WORLD, SOMETIMES IN THE MIDDLE OF THE NIGHT THE PHONE WOULD RING AND A CONVERSATIONS WOULD BE HAD. HOWEVER YOU HAD TO SEE WHAT YOU WERE DOING AS IN GETTING INTO THE DARK PHONE BOX. ALSO WHEN CALLING OUT AT NIGHT, THE CALLER NEEDED TO SEE THE TELEPHONE NUMBERS. READER, YOU WOULD BE SURPRISED HOW DARK THE DESERT NIGHT CAN GET. 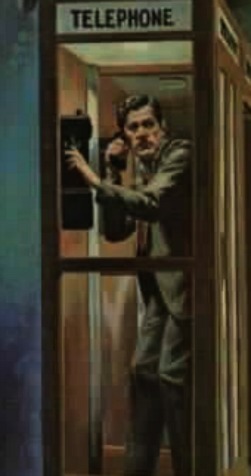 ON NIGHTS WHEN THERE WAS NO MOON AND CLOUD COVER, THE PHONE BOOTH WOULD BE CLOAKED IN DEEP DARKNESS. OF COURSE AT TIMES, SOME ADVENTURERS WOULD WIRE THE BOOTH SO YOU COULD GET LIGHT INSIDE THE BOX. OF COURSE YOU WOULD HAVE TO HAVE A DYNAMO OR CONVERTER AND BULBS. ABOVE -- DEPENDING ON THE VISITORS -- THE PLACE WAS SCAVENGED FOR LASTING TRINKETS! OR SOUVENIRS WERE LEFT ALONG WITH GRAFFITI. THERE WAS ALSO A SENSE OF TRIUMPH WHEN ONE USED THE DESERT PHONE. 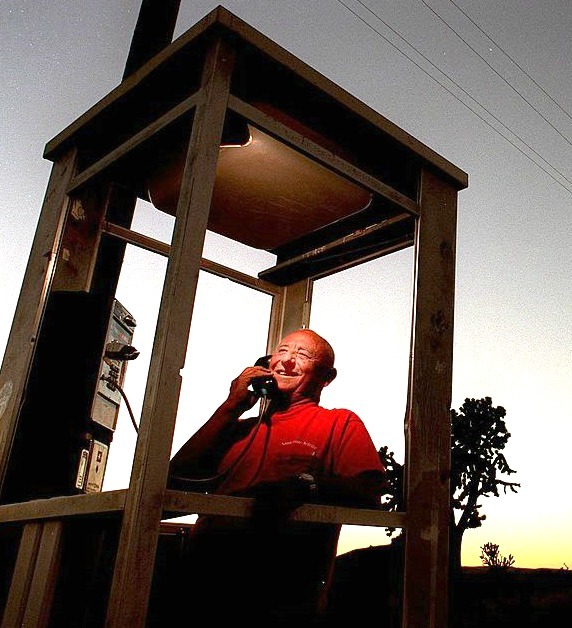 BELOW: DAY OR NIGHT -- YOU THE CALLER, OR YOU THE LISTENER WAS STANDING OUT IN THE BIG EMPTY DESERT -- WITH ONLY A TELEPHONE AND WIRE CONNECTING YOU TO CIVILIZATION. BELOW: Some comedy on the phone, it is kind of appropriate because one never knew who was going to call into the Mojave Phone Booth. WHEN THE BOOTH STARTED TO GET KNOWN, I AND A FEW OTHERS SPECULATED THAT THE GUN FIRED RIDDLED METAL FRAME WAS GOING TO BE BLOWN UP BY SOME GUY WITH BAD ATTITUDE. A DYNAMITE STICK IN THE MIDDLE OF THE NIGHT WOULD END IT ALL. OR SOME HELL RAISERS WOULD USE THE PHONE BOOTH AS A HEARTH OR FIRE STARTER FOR A GIANT EVENING BONFIRE. IF THAT DID HAPPEN, THE BOOTH BEING TORCHED OR BLOWN UP AND THEN REPLACED, I WAS UNAWARE OF IT. THE BOOTH WAS MAINLY FROM THE 1970s ONWARD A TARGET AND ITS GLASS WAS SHOT OUT. THE DOOR WAS PULLED OFF, HOW MANY DOORS, LIGHTS, PLASTIC/METAL COLORED SIDES AND WINDOWS THE BOOTH WENT THROUGH IS UNKNOWN. CONSEQUENTLY, THE BOOTH THROUGH THE DECADES WAS REPAIRED, BE IT GLASS, LIGHTS & PHONE. THIS MEANT THROUGH THE YEARS THAT THE PLASTIC COLOR SIDINGS DID CHANGE COLOR BE IT RED OR BLUE. IT IS A FACT, THE BOOTH DID TAKE A BEATING, NOTE THE BULLET HOLES IN THE DIFFERENT PICTURES. BUT THE GOOD ENERGY OF THAT PLACE, I THINK PREVENTED THE VANDALS FROM COMPLETELY OBLITERATING THE MPB. HOWEVER, IN THE BEGINNING AS IN THE 1960s INTO THE 1970s, THE MPB STILL HAD GLASS WINDOWS AND THE PLACE HAD NOT BEEN YET THOROUGHLY ATTACKED. PEOPLE WHO LEFT THERE MARK AT THE BOOTH, AT FIRST DID NOT DO THIS BY SACKING IT. FOR EXAMPLE, ONE FELLOW WHO IS NO LONGER ON THIS MORTAL COIL, "VULTURE", WHO WAS THE "KING OF THE BRODIES", WOULD LEAVE HIS MARK BY MAKING A BRODY IN THE GROUND WITH HIS FOUR WHEEL DRIVE TRUCK. 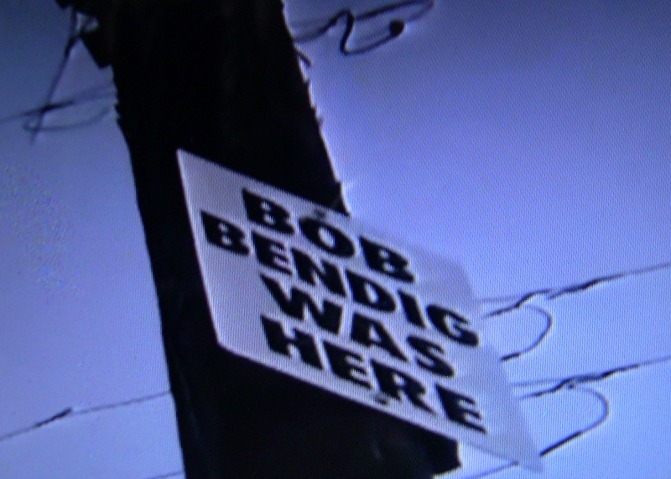 THE BRODIE OR BRODY (DOUGHNUT CUT INTO THE DIRT BY SPINNING A VEHICLE'S TIRES AT HIGH RPM) WOULD LAST FOR A MONTH OR MORE IN FRONT OF THE PHONE BOX, THERE ARE A FEW PHOTOS ON THE SITE THAT SHOW THAT "THE BRODY KING" HEAD BEEN THERE. LEFT: NOTE THE BRODY LINE LEFTSIDE OF MPB. THE POINT BEING -- AT ONE POINT IN TIME, PEOPLE WHO WENT TO THE MPB, DID NOT PILLAGE THE BOX, BUT THAT CHANGED AS SOCIETY CHANGED AND THE YEARS FLEW BY. BUT THEN AGAIN -- AS A COUNTER TO THE VANDALISM AND THE CRIMINAL ELEMENT THAT CAME TO THE BOOTH-- MORE CREATIVE GRAFFITI CAME TO THE PHONE BOOTH ALONG WITH GIFTS LEFT, AS IN PRAISE OF THE MPB AND TO THOSE THAT VENTURED TO IT. SPENT AND UNSPENT CANDLES, BULLETS AND CASINGS, ALONG WITH ARROWS, STUFFED ANIMALS, CHAIRS, AND WRITTEN MESSAGES WERE LEFT ON OR INSIDE THE MOJAVE PHONE BOOTH. YES THOSE ARE ARROWS AND STICKS ON THE LEFT. THIS MAGICAL PLACE WAS ABOUT 75-85 MILES SOUTHWEST OF LAS VEGAS NEVADA. THE BOOTH's POPULARITY GREW MAINLY FROM THE MID 1990's ONWARDS. CONSEQUENTLY DURING THE LAST YEARS OF THE CENTURY, THE PHONE BOOTH BECAME A CULT LOCATION, BECAUSE THE BOOTH-- BECAME A CULT SYMBOL. AS STATED BEFORE THE PHONE WAS ORIGINALLY A S.O.S. STATION--- TO THE OUTSIDE WORLD. IN SOME WAYS, MAYBE YEARS AFTER IT's INSTALLATION, SOMEBODY CALLING IN OR CALLING OUT OF THE MOJAVE PHONE BOOTH- BY WHO KNOWS HOW - GOT THEIR LIFE SAVED. A CONVERSATION ON THE PHONE OR THE TRIP TO THE MPB SAVED A LIFE. THE MOJAVE EXTENDING NORTHWARD INTO DEATH VALLEY. IN THIS DESERT A NUMBER OF CANTEEN SITES WITH LARGE SIGNS WERE SET UP IN THE EARLY 1960s. THE WATER CANISTERS AT THESE LARGE SIGN LOCATIONS WERE BURIED A FEW INCHES UNDER THE DIRT OR SAND. THESE SITES WERE PUT INTO PLACE DUE TO A STRING OF DEATHS THAT HAPPENED IN THE MOJAVE. SOMETIMES, THE DESERT WOULD ATTRACT VISITORS, WHO HAD NO IDEA JUST HOW MERCILESS THE CLIMATE WAS. THESE PEOPLE DID THERE BEST WITH THE CONDITIONS ONCE THEY GOT THERE, BUT FROM THE GET GO-- THEY WERE AT A DISADVANTAGE. THESE GREENHORNS WOULD SOMETIMES GO CAMPING AND THEIR KNOWLEDGE OF THE WADIS AND THEIR STAMINA WAS NOT UP TO SHUFF. A FEW TIME THESE NOVICES WOULD GET LOST OR THEIR CAR WOULD BREAK DOWN IN THE OUTBACK etc. THE IDEA; THESE EMERGENCY OASIS'S WOULD SAVE PEOPLE's LIVES. SADLY THESE WATER CANTEEN SITES WERE PRETTY MUCH THOROUGHLY DESTROYED BY THE LATE 1960s BY VANDALS. THE WATER STORAGE UNITS WERE DUG UP, EMPTIED OR HOLED. OF COURSE MAYHEM NOW AND THEN WOULD BEFALL A DESERT RAT, BUT THE RIDER OR JEEPSTER KNEW HOW TO HANDLE THE RUGGED CLIMATE, AND THAT PERSON HAD A CHANCE WHEN IT CAME TO LIFE AND DEATH MOJAVE SITUATIONS. AS FOR THE PHONE AND IT NOT FUNCTIONING. AT TIMES -- LIKE THE VANDALIZED EMERGENCY CANTEENS, THE PHONE WAS BROKEN BY A RUFFIAN OR GROUP, BUT THIS WAS RARE. LIKEWISE, WHEN THE CHORD TO THE PHONE WOULD BE CUT AND THE HAND PHONE WOULD BE TAKEN, OR WHEN THE WHOLE DEVICE WOULD BE MANGLED, PERHAPS WITH A HAMMER, AGAIN THIS WAS NOT COMMON. WHEN THE PHONE WAS OUT OF ORDER, WATER TENDED TO BE THE CULPRIT. YES, IT DOES OCCASIONALLY RAIN IN THE DESERT. WHEN IT DOES STORM, THE WATER COMES DOWN IN GOOD QUANTITIES. WITH THE BOOTH's GLASS KNOCKED OUT AND THE ROOF BULLET HOLED, THE PHONE WOULD GET WET AND GIVE OUT. WATER OR LATER RUST WOULD DO IN THE DEVICE. CLICK ON LEFT ICON FOR FOOTAGE OF WHAT A MOJAVE MONSOON CAN BE LIKE. ALSO DUST, SAND, HEAT AND WINTER MOISTURE WOULD FOUL UP THINGS AND CAUSE THE PHONE TO BREAK. REMEMBER THE PHONE BOOTH WAS GUTTED, WHEN THE WIND BLOWS IN THE DESERT, IT IS A SANDSTORM DELUXE. LEFT ICON - CLICK ON IT-- A SHORT VIDEO ON A SANDSTORM IN THE MOJAVE. SOMETIMES, THE STORMS ARE WORSE THAN WHAT IS VIDEO TAPED. 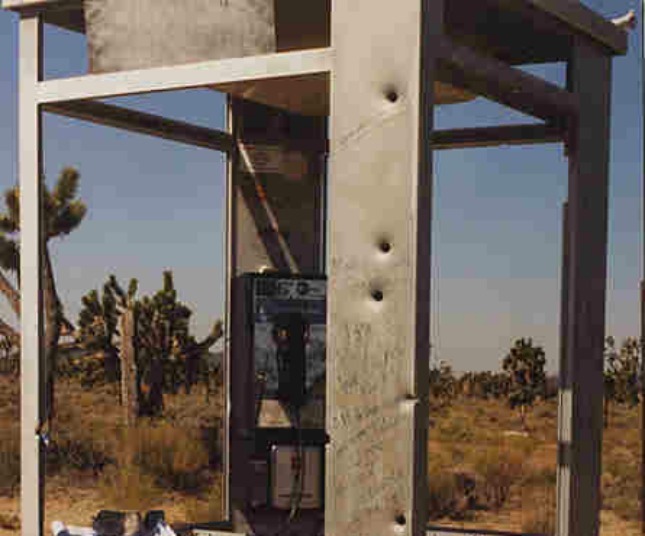 WITH NO WINDOWS, THE MOJAVE PHONE BOOTH TOOK A BEATING WHEN IT STORMED. DURING THE WINTER, IT DOES GET COLD ENOUGH IN THE DESERT THAT SOMETIMES A LIGHT FROST CAN HAPPEN. THIS FROST WOULD NOT HAPPEN OFTEN. THE POINT BEING, THE WEATHER IN THE DESERT IS EXTREME. 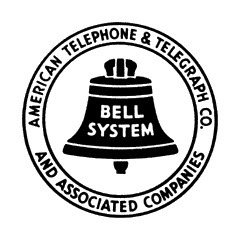 SO "MA BELL" (TELEPHONE COMPANY) THROUGH THE DECADES DID HAVE TO REPAIR THE PHONE. NOTE IN THESE PICTURES THE DIFFERENT PHONE MODELS. THE PHONES EITHER BROKE OUT OF USE AND THE ELEMENTS, OR THEY WERE PURPOSELY DESTROYED. 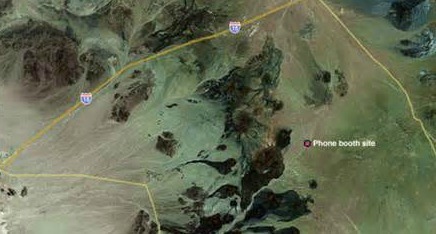 ACCORDING TO A GOVERNMENT DOCUMENT, ONE DESTROYER OF THE PHONE, AND I ONLY FOUND THIS OUT AGES AFTER THE PHONE WAS PULLED FROM THE DESERT, WAS A MOJAVE PHONE BOOTH NEIGHBOR. IN A 2004 MOJAVE ADMINISTRATION HISTORY (DOCUMENT), AND THESE GOVERNMENT REPORTS GATHER ALL KINDS OF FACTS. 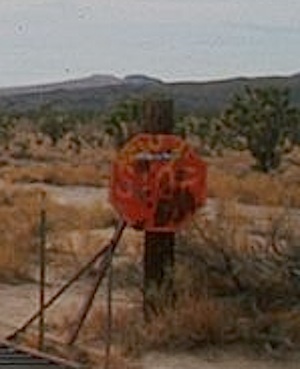 MARY MARTIN, WHO WAS THE SUPERINTENDENT OF THE MOJAVE RESERVE (THE AREA WHERE THE MPB WAS LOCATED), CLAIMED THAT MOJAVE RANCHER TIM OVERTON WOULD OCCASIONALLY CUT THE MOJAVE PHONE BOOTH's PHONE WIRE. ACCORDING TO MARTIN, OVERTON WOULD NEVER ADMIT TO THE DEED PUBLICLY. WHY WOULD THIS MAN CUT THE PHONE's CORD? 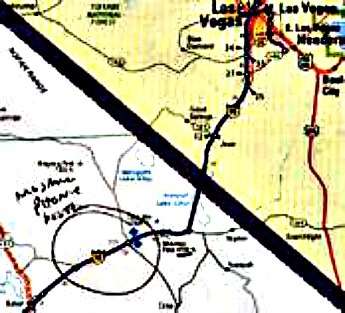 ONE OF THE ROADS THAT RAN TO THE MOJAVE PHONE BOOTH RAN PAST HIS DIRT ROAD DRIVE WAY, OR RAN CLOSE TO OVERTON's FRONT DOOR. WHEN INTREPID VOYAGERS WOULD GET STUCK IN THE SAND ON THIS MPB ROAD IN THEIR NON-4WHEEL DRIVE VEHICLES. THE UNPREPARED GREENHORNS WOULD WALK OVER TO OVERTON's, KNOCK ON HIS DOOR AND ASK FOR HELP. MARY MARTIN CLAIMED, OUT OF REVENGE FOR BEING BOTHERED OVERTON DID THE ACT. SNIP SNIP WENT THE CABLE TO THE HANDSET. 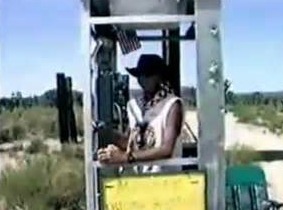 DID THIS RANCHER THINK THIS ACTION WOULD STOP PEOPLE FROM VISITING THE PHONE BOOTH? IT DID NOT, AND THERE WERE MANY WAYS THIS RANCHER COULD HAVE MADE PROFIT OFF OF HIS LOCATION. FOR EXAMPLE: OVERTON COULD HAVE MADE A FORTUNE BY CHARGING HIGH PRICES TO TOW PEOPLE OUT OF THE SAND. ALL HE HAD TO DO WAS BUY A GOOD WINCH, AND HAVE A RELIABLE 4 WHEEL DRIVE VEHICLE AND MONEY COMES HIS WAY. 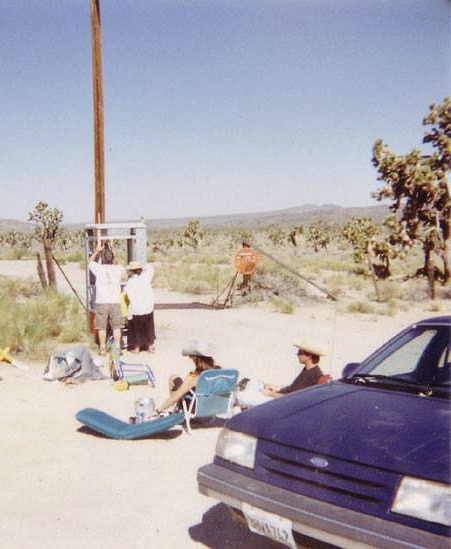 BY THE LATE 1990s, A LOT OF PEOPLE WERE VISITING THE PHONE BOOTH AND A NUMBER OF THE VISITORS' VEHICLES WERE GETTING STUCK IN THE SAND. YES, THERE WERE PLACES BY THE MOJAVE PHONE BOOTH THAT WERE SANDY LANES. IF YOU DID NOT KNOW HOW TO DRIVE IN SAND, YOU COULD GET STUCK. OF COURSE IF YOU WERE IN A 4 WHEEL DRIVE VEHICLE, OR ON A MOTORCYCLE THE DESERT LANE WAS A PIECE OF CAKE. OR IF YOU WERE IN A NON ALL TERRAIN VEHICLE, IF YOU LOWERED THE AIR PRESSURE ON YOUR TIRES, YOUR CHANCE OF GETTING STUCK WERE LESS. LOW AIR PRESSURE IN TIRES? IN THE SAND, DEPENDING ON THE VEHICLE, IF MORE TIRE RUBBER MEETS THE SAND, DUE TO LESS AIR IN THE TIRES, YOU GET BETTER TRACTION IN THE SAND. THIS MEANS LESS CHANCE OF BOGGING DOWN. 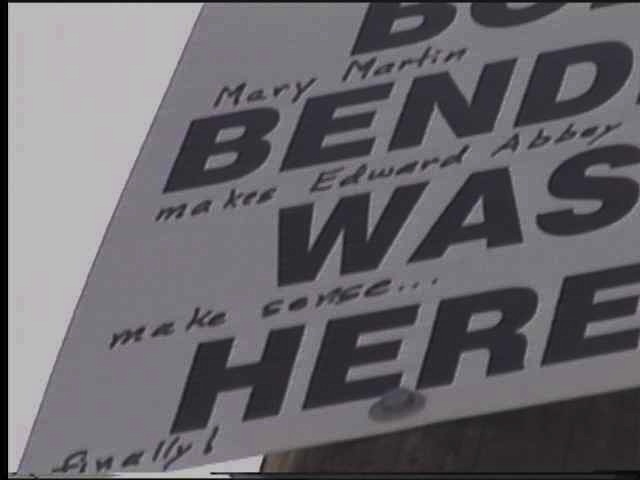 AS FOR MARY MARTIN A GOVERNMENT EMPLOYEE KNOWING ABOUT VANDALISM TO THE MPB, AS IN WHO SABOTAGED THE PHONE. I WONDER IF SHE WAS PRO SABOTAGE. IN THE END OF THE MPB's LIFE, MARY MARTIN WAS ONE OF THE PEOPLE WHO HAD "BIG BROTHER" POWER AND ENDED UP MAKING OR RUBBER STAMPING THE DECISION TO YANK THE PHONE FROM THE DESERT. IT SEEMS MARY MARTIN AND THE PREVIOUS MENTIONED MRS. P______, AND THE OTHER NATURE FANATICS WERE ALL OF THE SAME MIND SET. MANKIND IN THE DESERT IS A NO-NO. DO WHATEVER IT TAKES TO KEEP HUMANITY FROM VISITING THE SANDY WILDERNESS. WHAT DID MARY MARTIN THINK ABOUT THE PHONE LINE BEING CUT BY RANCHER OVERTON? WELL, SHE DID SPEARHEAD THE REMOVAL OF THE BOOTH. ONE TIME, THE WHOLE HANDSET WAS MISSING. DID THE PERSON WHO CUT THE LINE, TAKE THE PHONE HANDSET? OR DID A DISAPPOINTED VISITOR SEE THE DESTRUCTION AND TAKE A KEEPSAKE? SUPPOSEDLY AT TIMES A PHONE PART WOULD GIVE OUT BECAUSE A LIGHTENING BOLT WOULD HIT THE BOOTH DURING A STORM AND FRY THE INNERS OF THE PHONE. THAT IS A GOOD STORY, I WONDER IF IT IS TRUE. BUT AT THIS ENCHANTED PLACE IN THE DESERT, ANYTHING WAS POSSIBLE. CLICK LEFT STORM ICON FOR FOOTAGE OF JUST HOW VIOLENT A LIGHTENING STORM CAN BE IN THE MOJAVE. AS THE SITE BECAME POPULAR AND WAS VISITED MORE OFTEN - MID 1990s ONWARD. IN MY OPINION LESS VANDALISM HAPPENED TO THE MPB. BECAUSE NOW THERE WERE PEOPLE CAMPING AT THE PHONE BOOTH OR VISITING THE PHONE BOX DURING THE DAY. NOT ALL THE TIME, BUT ENOUGH, IN THAT THESE SEARCHERS THWARTED BAD DEEDS TO THE MPB. IN OTHER WORDS, THESE VOYAGERS WOULD NOT LET WHAT WAS LEFT OF THE PHONE CUBICLE BE FURTHER DESTROYED. ALSO THE PILGRIMS TO THIS SITE, WERE ABLE TO GLEAM THE MAGIC THERE, SO THE BOX BECAME A PLACE THAT WAS RESPECTED. 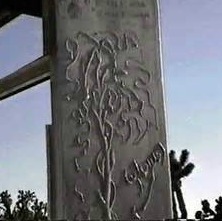 PRIOR TO THE MID 1990s, PILGRIMS TO THE BOOTH HAD LEFT MEMENTOS ON THE METAL FRAME ALONG WITH GRAFFITI. BUT FROM THE MID 1990s ONWARD, TREKKERS WOULD PLACE PHONE LOGS INSIDE THE BOX. WOULD THEY BE COLLECTED BY THE OWNER, I DOUBT IT. WHO KNOWS WHO TOOK THEM, ANOTHER VISITOR. THE ACT OF MAKING A LOGBOOK OF CALLS FOR PERSONAL USE OR THE ACT OF LEAVING TELEPHONE LOGBOOKS, MEANT A DIFFERENT KIND OF THINKING WAS GOING ON WITH THE NEW BREED OF VISITORS WHO CAME TO THE MPB. THESE NEWBIES WANTED TO DOCUMENT FROM WHAT FAR OFF PLACES PEOPLE WERE COMMUNICATING FROM. PARAPHRASING JANE GOODALL FROM HER AFRICAN PRIMATE 1960s DOCUS, "THE CHIMPANZEES HAVE ELEVATED THEMSELVES INTO A HIGHER TRIBE MENTALITY." THIS THEME (LOGBOOKS) WAS RARE PRIOR TO THE LATE 1990s. THE IDEA OF DOCUMENTATION WAS ALMOST NILL UP UNTIL THE MOJAVE BOOTH BECAME THE "IT" PLACE. FOR THE "OLD BREED" THE MPB WAS ALWAYS THE "IT" PLACE. BUT THE "OLD BREED" WAS NOT AS SENTIMENTAL AS THE YOUNGER GENERATIONS. WITH THE "NEW BREED; THERE WAS AN OUT POURING OF EMOTION FOR THE BOOTH. 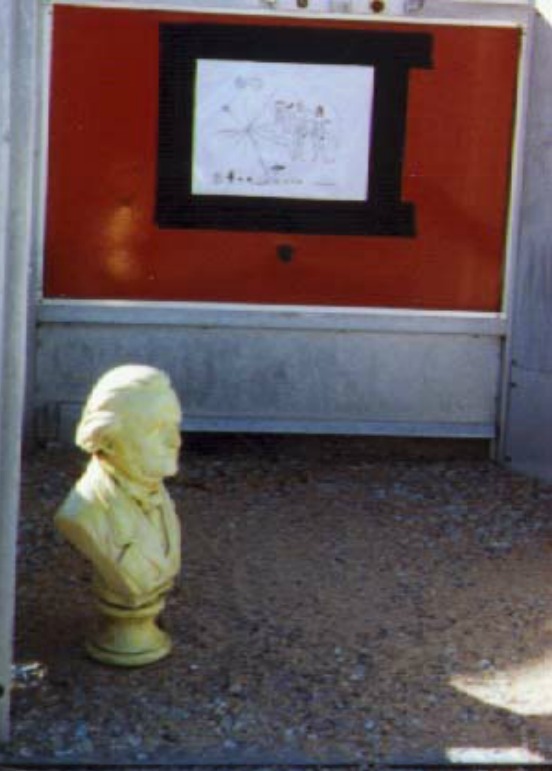 SURE THE BOOTH HAD BEEN DECORATED AND HONORED PRIOR TO THE 1990s, BUT FROM THE MID 1990s ON --- THE MOHAVE BOOTH BECAME A CULT ICON TO THE WORLD. THE MPB WAS A 1990s THAAAAAANG, EVEN THOUGH IT HAD BEEN AROUND FOR DECADES. DURING THE MPB's ZENITH OF VISITS, GOOD SAMARITANS WOULD SWEEP OUT THE BOOTH's FLOOR. EXPOSING (SURPRISE) A METAL BOTTOM. WITH THE ADVENT OF THE INTERNET THE DAYS OF THE OLD BOOTH BEING ALONE IN THE DESERT AND OCCASIONALLY BEING VISITED BY A DESERT RAT ON HIS MOTORCYCLE OR IN A BAJA BUG WAS OVER. AMERICANS FROM COAST TO COAST CAME TO SEE THE MPB. THESE PIONEER-ZEE PEOPLE BRAVED THE SAND ROADS IN REGULAR CARS NOT DUNE BUGGIES. SOME SAND PEOPLE -- BIKERS - JEEPSTERS GOT ANGRY AND THOUGHT THE PLACE IS RUINED WITH ALL THESE NEW MPB VISITORS. THINGS CHANGE, NOTHING STAYS THE SAME. 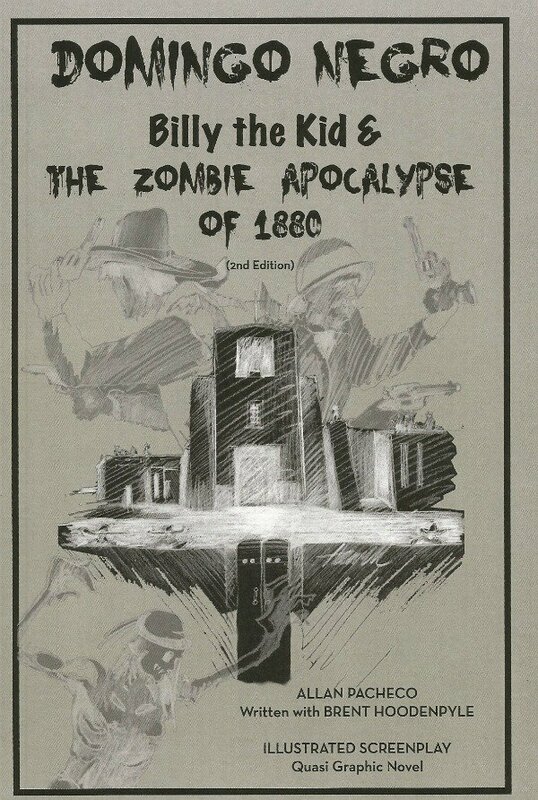 THE MAJORITY OF THE NEW VISITORS - FOR THE MOST PART WERE NOT ON THE SAME MENTAL REALM AS THE OLD DESERT RIDERS, AS KNOWING WHERE SECRET TRAILS, ABANDONED MINES AND RUINS WERE LOCATED. HOWEVER, IN OTHER WAYS, DARE I WRITE IT, THE NEWBIES WHO KNEW NOTHING ABOUT THE DESERT, RESPECTED THE MPB MORE THAN THE OLD BREED. THE QUESTERS THROUGH THE INTERNET, MAGAZINES, WORD OF MOUTH HAD TURNED THE MPB INTO A WORLD LANDMARK. 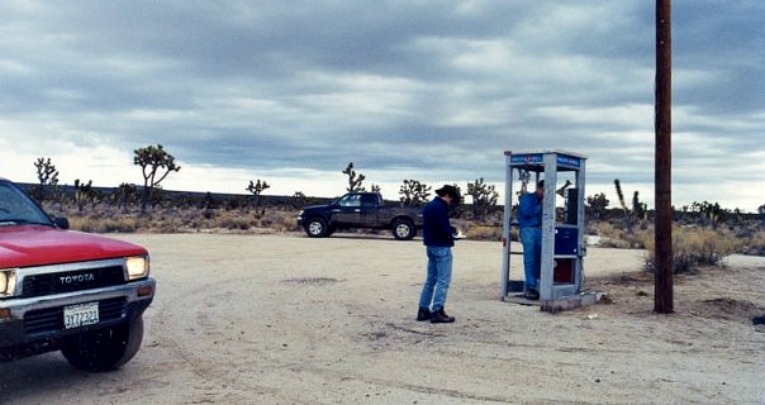 THE MOJAVE PHONE BOOTH WAS FROM THE LATE 1990s HONORED AROUND THE GLOBE. AND, AND, AND, THAT IS NOT BAD. 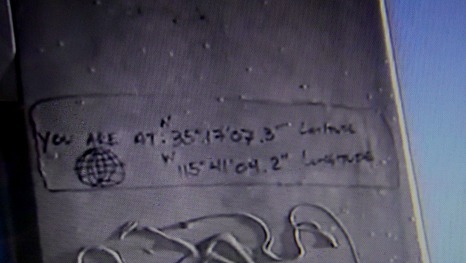 IN THE SNAPSHOTS, NOTICE HOW THE GRAFFITI CHANGED OVER THE YEARS. 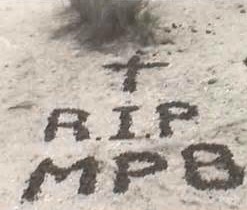 DUE TO HUMANS AND NATURE, THE MARKINGS ON THE MPB DID NOT LAST. IN SOME WAYS THE NOTES LEFT ON THE FRAME ARE RATHER LIKE A METAPHOR FOR LIFE, NOTHING LASTS FOREVER. 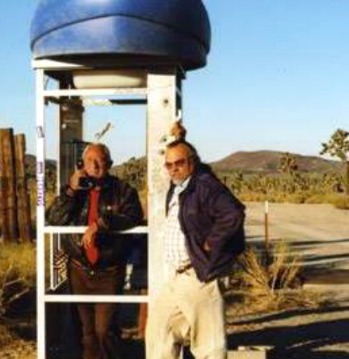 BUT WHILE THE MOJAVE PHONE BOOTH EXISTED, IT WAS AT TIMES OR A LOT OF TIMES, A PLACE OF WISDOM AND FUN. ABOVE LEFT & LEFT ARE TWO LATE 1990s VIDEO ON THE MPB. THE LEFT IS A NEWS BROADCAST. THE BOTTOM LEFT IS SHORT MOVIE ABOUT THE MOJAVE PHONE BOOTH, IT IS RATHER GOOD. 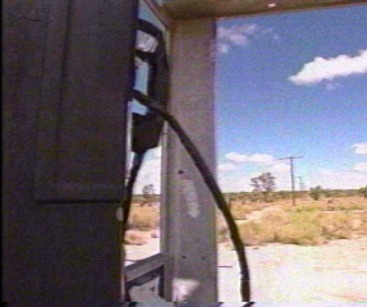 BOTH BROADCAST AND SHORT DOCU WERE MADE AFTER THE DESERT PHONE HAD BEEN DISCOVERED BY THE WORLD. NOTE HOW MANY PEOPLE WERE NOW TRAVELING TO THIS LOCATION, PLUS HOW MANY STRANGERS WERE CALLING IN. CLICK ON VIDEO ICONS. PRIOR TO THE MID TO LATE 1990s, FEW PEOPLE KNEW OR VENTURED OUT TO THE MPB. THOSE THAT WENT WERE BIKERS, THE BAJA BUG OR DUNE BUGGY SAND PEOPLE. THE LEFT SECOND TO LAST VIDEO I THINK KIND OF SUMS UP THE ADVENTURE SPIRIT THAT PEOPLE HAD TO GET TO THE MOJAVE PHONE BOOTH. 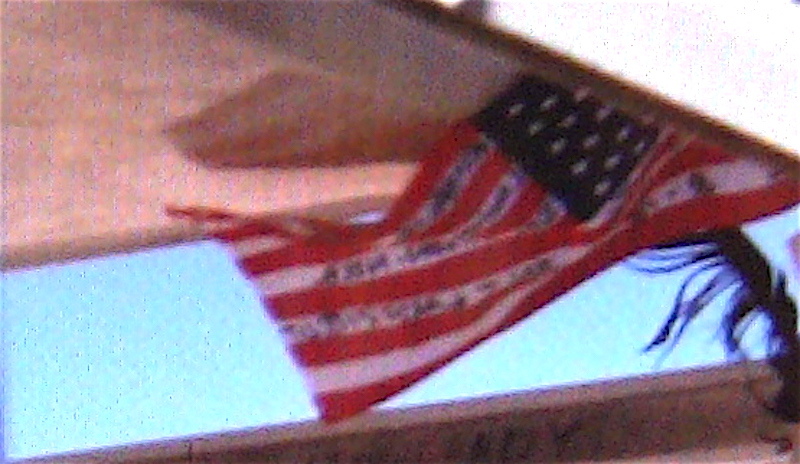 THE VIDEO IS A COMMERCIAL FOR NORTH FACE THAT HAS THE SONG "THIS LAND IS MY LAND, THIS LAND IS YOUR LAND". 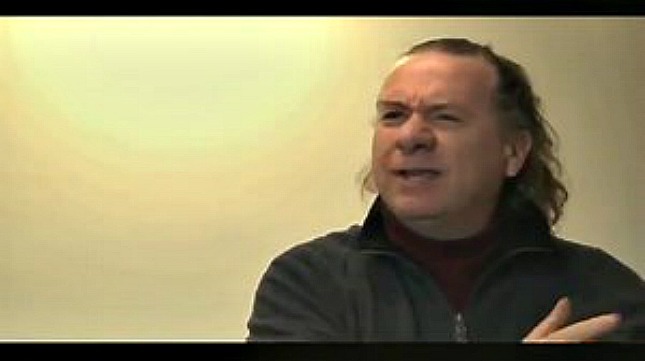 THE LAST VIDEO IS A FUNNY CONVERSATION OF A VILLAIN AT A CAR WRECK GETTING THRASHED. 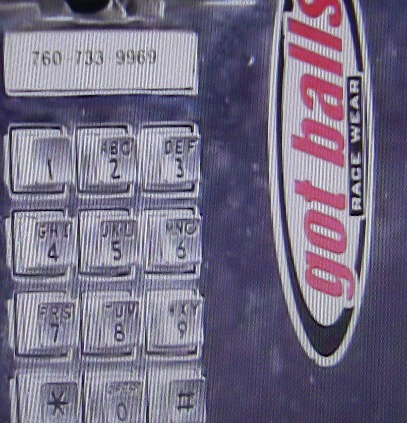 ODD AND HUMOROUS CONVERSATIONS DID HAPPEN AT THE MOHAVE PHONE BOOTH. THE LAUGHTER IS CONTAGIOUS AND THE HAUNTING GOOD ENERGY AT THE BOOTH WAS FROM THE PEOPLE WHO CAME THERE TO SEE AND USE THE PHONE. THE VAST MAJORITY OF TIMES, WHEN THE PHONE LINE WAS NOT OPEN, IT WAS BECAUSE THE PHONE WAS BROKEN OR THE LINE HAD BEEN CUT. OF COURSE EVERY NOW AND THEN- FOR SOME ODD OR BAD REASON, A SOLO USER WOULD LEAVE THE PHONE OFF THE HOOK, ONLY WHEN SOMEBODY GOT TO THE BOOTH AND PUT THE PHONE BACK IN PLACE WOULD THE LINE WOULD BE OPEN. 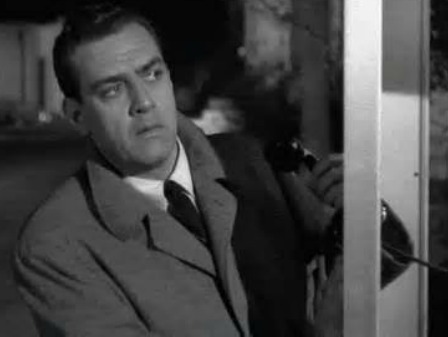 NEAR THE END OF THE PHONE BOOTH's EXISTENCE, WHEN THE LINE WAS NOT OPEN, IT WAS BECAUSE SOMEBODY WAS CALLING IN OR OUT. BY THE MID 1990s THE SECRET WAS OUT! PEOPLE WANTED TO CALL FROM OR TO, THE EDGE OF THE WORLD! AT TIMES IN THE LATE 1990s DUE TO THE WEB AND MEDIA, WAVES OF PILGRIMS VISITED THE MPB. CONSEQUENTLY THE CALLERS HAD TO WAIT IN LINE TO USE THE PHONE. WERE THERE FIGHTS, TO USE THE TELEPHONE? I DO NOT KNOW OF ANY, I AM SURE SOME PEOPLE GOT GRUMPY. WAITING TO USE A DESERT PHONE AMONGST MAYBE 30 PEOPLE, MOSTLY STRANGERS, COULD BE DIFICULT. HOWEVER!!! FOR MOST OF THE PHONE BOOTH's LIFE OR UP UNTIL THE MID TO LATE 1990s, NOBODY WAS AT THE PHONE. WHEN A CALL CAME INTO THE DESERT PHONE BOOTH, THE DESERT AROUND THE BOOTH WOULD REVERBERATE WITH THE SOUND OF RINGING AND RINGING. LEFT ICON: A CREATIVE COMMERCIAL FOR GREY GOOSE VODKA. 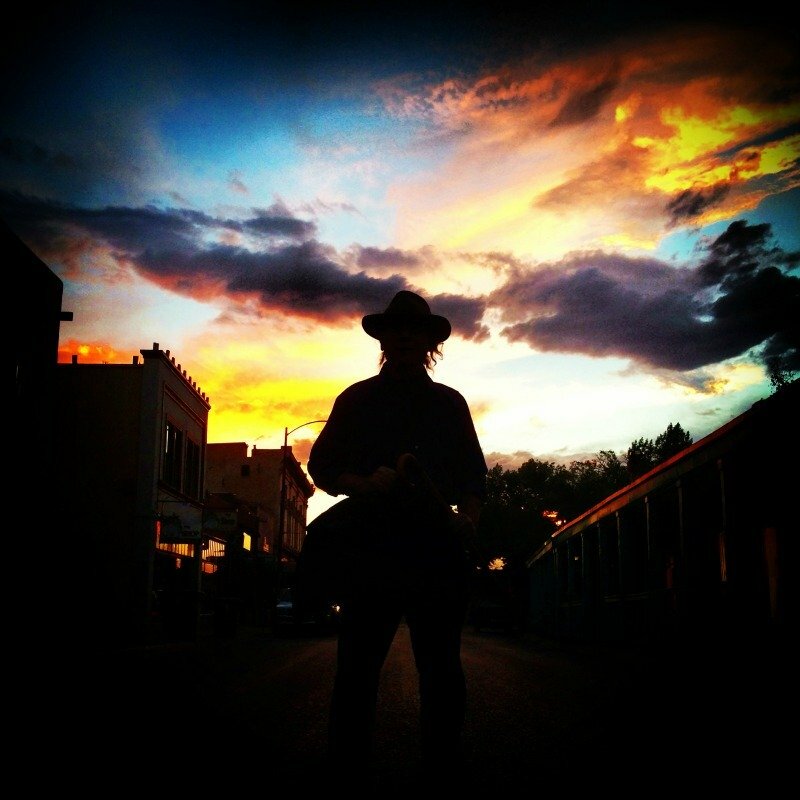 I THINK IN SOME WAYS IT CAPTURES THE MAGIC OF TRAVELING TO THE MOJAVE PHONE BOOTH OR THE ENERGY THAT WAS AT THE MPB . ------------LEFT PICTURE----BEFORE THE SAFARI -- ALLAN ON HIS TRIUMPH---"IN SEARCH OF THE MAGIC DESERT PHONE"!--------WHAT A BIKE! THE BEST ALL TERRAIN MOTORCYCLE IN ITS TIME -- THE ENGINE's TORK WAS INCREDIBLE. SINCE THAT PICTURE OF SO MANY YEARS - SO MANY DECADES AGO-- (LAST CENTURY) WAS TAKEN. A LOT OF ALLAN's FAMILY AND PALS HAVE DIED. PEOPLE PASS ON & TRAGEDIES DO HAPPEN. 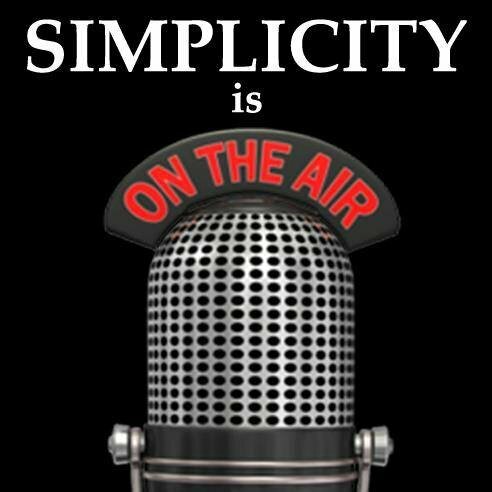 WORDS OF WISDOM -- DO NOT WASTE YOUR LIFE BEING A SOFA POTATO OR A SHEEPLE TYPE PERSON -- THINK FOR YOURSELF -- DO NOT LET TELEVISION BE YOUR COMPASS, BE OF GOODWILL, GROW YOUR SOUL & JUST DO IT -- YOUR GOAL! BELOW: WHEN THE MPB STILL EXISTED-- AGES LATER (A MUCH OLDER) -- ALLAN YOUR TOUR GUIDE & AUTHOR GETs ANGRY. THE MOJAVE PHONE BOOTH LINE IS BUSY! HANG UP & PICK UP! RING-RING. WHO IS AT THE END OF THE LINE? NOBODY IS AT THE MPB. SO - IT IS A SAD RING -BECAUSE NO PICK UP. THE PHONE BOOTH - THE PHONE - THERE WAS MAGIC! 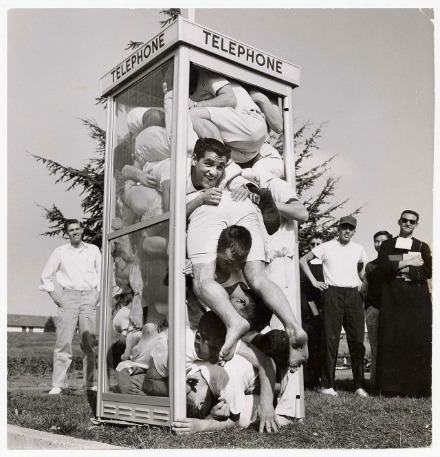 THE ONLY TWO THING THAT DID NOT HAPPEN AT THE DESERT PHONE BOOTH OR THERE IS NO PHOTO EVIDENCE OR EYE WITNESS ACCOUNTS OF THESE THINGS HAPPENING; IS THE 1950s FAD OF SEEING HOW MANY PEOPLE CAN SQUEEZE INTO A BOOTH….AS IN SARDINES PILED UP ONE ATOP THE OTHER, 1950s STYLE. 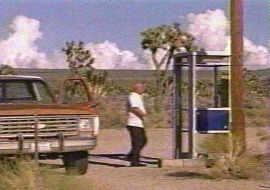 ALSO THE LOVE LOCK FAD DID NOT CATCH ON AT THE MOJAVE PHONE BOOTH. WHAT IS THE LOVE LOCK? PEOPLE PLEDGE THEIR LOVE TO A PERSON OR ITEM, THEY THEN WRITE THEIR NAME OR INITIALS ONTO A PADLOCK. THE PERSONALIZED LOCK IS CLAMPED ONTO A PIECE OF METAL OR CABLE AND ITS KEY IS THROWN AWAY. THE LOCK WITH THE NAMES OR LETTERS IS NOW PART OF THE METAL FRAME OR BEAM. OTHER LOCKS BY OTHER PEOPLE ARE PUT ONTO THE OBJECT, AND IN TIME A WALL OF PADLOCKS MAKE UP A CERTAIN AREA. THIS FAD BECAME POPULAR IN EUROPE DURING THE LAST YEARS OF THE DESERT PHONE BOOTH. METAL BRIDGE RAILINGS AT ROMANTIC SITES, WERE FILLED WITH INSCRIBED PADLOCKS. 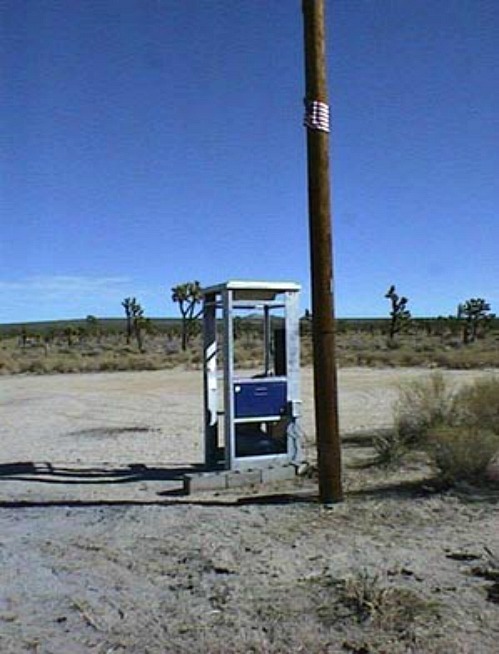 THE MOJAVE PHONE BOOTH COULD MAKE A PERSON RETHINK IDEAS OR THEMES, ON MANY LEVELS! THE LOVE LOCK IS A CUTE IDEA, BUT ANYBODY CAN DO THAT. LATCH A LOCK TO A PIECE OF METAL WITH INITIALS OR NAMES. 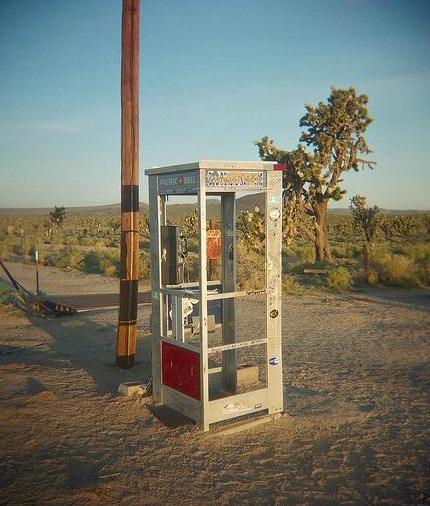 THE MOJAVE PHONE BOOTH WAS NOT CUTE IT WAS RUGGED, LIKE THE LAND IT STOOD ON. MAYBE THAT IS WHY THE PADLOCK FAD DID NOT TAKKE ROOT IN THE DESERT. THROUGH THE DECADES THE PHONE BOX WAS SHOT TO PIECES BUT THE METAL BOX SURVIVED AND BECAME AN ICON. I CAN NOT THINK OF ANY OTHER PHONE BOOTH THAT WAS BLASTED AND PILLAGED SO MANY TIMES, THEN REPAIRED. DECADE AFTER DECADE THE PHONE BOOTH KEPT BEING THAT MAGICAL PLACE. ALSO, NO GROUP OF EGOTISTICAL ARTISTS NEVER DID TRY TO MAKE A STATEMENT AT THE LOST PHONE BOOTH BY PUTTING CHAINS OR HOSES AROUND THE FRAME AND THEN PADLOCKING THE STRUCTURE CLOSED. NEW WAVE ARTISTS OF DECADES PAST TENDED TO DO WHATEVER IT TOOK TO DRAW ATTENTION TO THEMSELVES BY THEIR ANTICS DISGUISED AS ART. IF A MISGUIDED OBNOXIOUS ARTIST HAD TRIED TO ROPE OFF OR CHAIN OFF WHAT WAS LEFT OF THE BOOTH, A VISITOR WITH BOLT CUTTERS WOULD HAVE LIBERATED THE PHONE BOX BY CUTTING THROUGH THE CHAINS, CABLE, AND LOCK. THROUGH THE YEARS THE MOJAVE PHONE BOOTH GOT UNIQUE OFFERINGS. WHY THE PRESENTS? BECAUSE OF THE ENERGY THAT BEAMED FROM THAT CUBICLE AND PHONE. 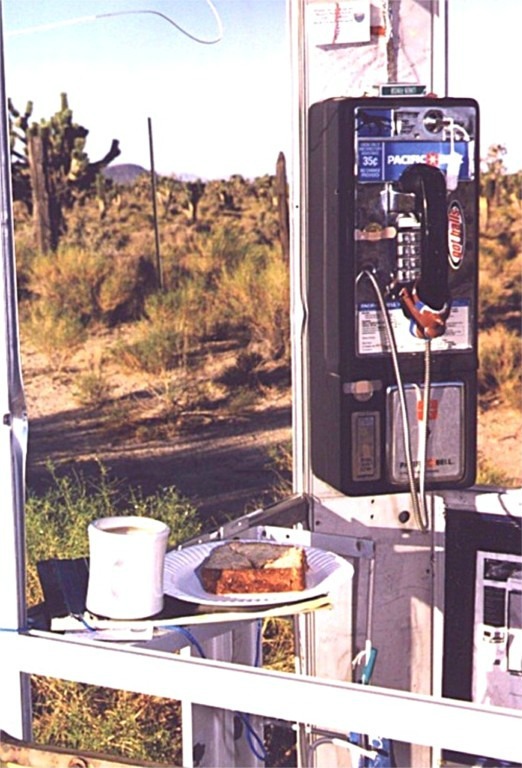 THE DESERT PHONE BOOTH WAS NOT A ROMANTIC PLACE, LIKE A PARISIAN BRIDGE. THE PHONE BOX WAS A LOCATION -- THAT MARKED WHERE CIVILIZATION ENDED, AND WHERE ADVENTURE AND SOMETIMES, WHERE ENLIGHTENMENT BEGAN. THE HAUNTED TELEPHONE BOOTH SAW ALMOST EVERYTHING; ADVENTURERS, LOVERS, VANDALS, ROMANTICS, AND SOME VERY UNIQUE PEOPLE. LEFT - ONE GUY STANDS ALONE AS FAR AS NOT BEING ASLEEP AT THE SWITCH WAS SLIM TEXICAN, RICK KARR-- WHO ACCORDING TO LORE AND SOME FACT, AT AGE 51 IN 1999--STAYED AT THE BOOTH FOR 32 DAYS. THIS MAN TALKED TO PEOPLE WHO CALLED IN. KARR LIVED OUT OF A SMALL RED TENT, AMONGST THE WEEDS. HOW THIS GUY DID NOT GET BIT BY RATTLESNAKES IS A GOOD QUESTION. A DIVINE FORCE WATCHED OVER HIM. RICK KARR TALKED TO PEOPLE FROM AROUND THE WORLD & TOLD THEM -- AT TIMES -- TO REPENT --- THE MAN WAS ON A SPIRITUAL JOURNEY OR MISSION. KARR NOW AND THEN WOULD QUOTE THE BIBLE, IN ORDER TO ILLUSTRATE HIS MESSAGE. 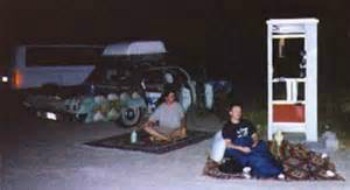 LEFT -THEN THERE WAS "DESERT CHAD", WHO ALSO CAMPED OUT AT THE PHONE IN THE LATE 1990s. SOME WIERD BEARDS, SAY THAT KARR AND CHAD WERE ONE IN THE SAME. EL WRONGO! KARR HAD A PANHANDLE TWANG, HE WAS ORIGINALLY FROM AMARILLO, TEXAS; BUT CAME TO THE BOOTH FROM BULLHEAD CITY, ARIZONA. DESERT CHAD, HAD NO ACCENT, WAS FROM NORTHERN CALIFORNIA AND WAS A RATHER YOUNG LOOKING GUY. CHADRACK! DESERT CHAD WAS A GOOD GUY WHO HAD THAT-- BE OF GOODWILL AND LIVE LIFE TO THE FULLEST ATTITUDE. 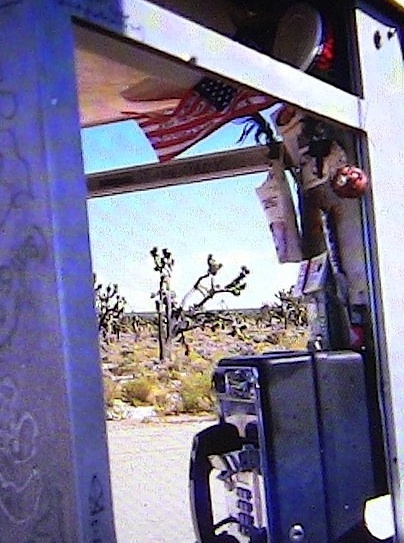 ON ONE OF DESERT CHAD's SOLO ODYSSEY's TO THE MOJAVE PHONE BOOTH, HE MET UP WITH A FILM CREW. CHAD WAS THE GUIDE AND HISTORIAN FOR THE GROUP. THE WORLD NEEDS MORE DESERT CHAD's, AN ALL AROUND GOOD GUY. LEFT- DESERT CHAD LEFT HIS MARK ON THE MOJAVE PHONE BOOTH ALONG WITH MISTRESS CARRIE, WHO IS A THROWBACK TO THE 1960s THIRLL SEEKERS! 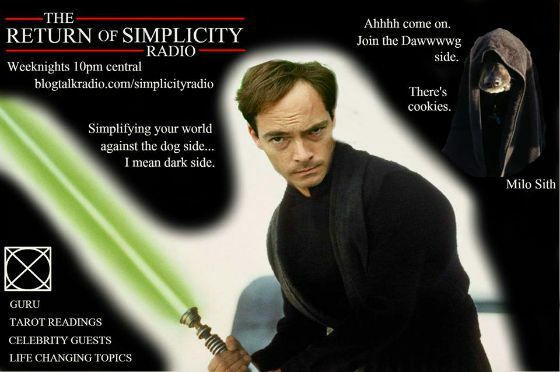 BELOW LEFT IS "MISTRESS CARRIE" WHO IS THE MUSIC DIRECTOR & AFTERNOON DRIVE HOST OF WAAF 97.7 or 107.3 BOSTON www.waaf.com 3-7PM EASTERN…. I THINK GODFREY DANIELS SHOULD BE CONSIDERED THE "CHRISTOPHER COLUMBUS" OF THE PHONE BOOTH. 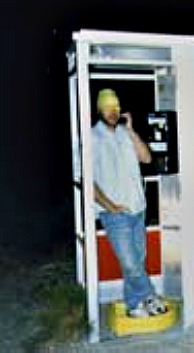 YES, I AND SOME OTHERS KNEW OF THE PHONE BOOTH DECADES BEFORE DANIELS, WHO AT AGE 34 IN 1997 DISCOVERED IT. HOWEVER, I AND THE DESERT RATS WERE LIKE THE VIKINGS OF OLD, WE KNEW ABOUT "THE NEW WORLD", BUT WE DID NOTHING WITH IT. THE AGE OF DISCOVERY CAME ABOUT DUE TO DANIELS - THE MPB's CHRISTOPHER COLUMBUS. DANIELS THROUGH THE BUDDING INTERNET OF THE 1990S -- LET THE REST OF THE WORLD KNOW WHAT A WONDERFUL PLACE THE MPB WAS. DANIELS WHO WAS A COMPUTER WIZ -- IN ESSENCE, TOLD THE "OLD WORLD" ABOUT THE "NEW WORLD" -- AND THE "NEW WORLD" WAS THE MOJAVE PHONE BOOTH. THE RUSH WAS ON FOR PEOPLE TO GO OUT AND FIND IT AND SOMETIMES CAMP OUT AT IT. OVERNIGHTERS HAPPENED AT THE MPB. FIREPITS WERE DUG AND SOMETIMES SCRAPS OF WOOD WAS BROUGHT IN. THE MATERIAL THAT WAS NOT USED WAS LEFT BEHIND FOR THE NEXT CAMPFIRE. 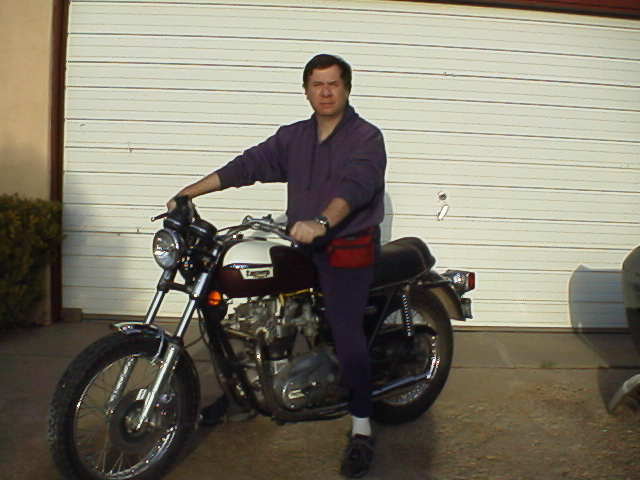 AT ONE TIME, IN THE DESERT YOU WOULD ONLY FIND BIKERS LIKE ME AND BAJA BUG PEOPLE + JEEPSTER, BUT THOSE DAYS WERE NOW OVER. PEOPLE WITH ADVENTURE IN THEIR HEART, WHO KNEW NOTHING ABOUT THE DESERT TOOK WHATEVER VEHICLE THEY HAD, EVEN IF IT WAS NOT A GOOD ROUGH TERRAIN AUTO, AND OFF THEY WENT TO FIND THE PHONE BOOTH. TO ME, THIS WAS THE AMERICAN SPRIT IN ACTION. 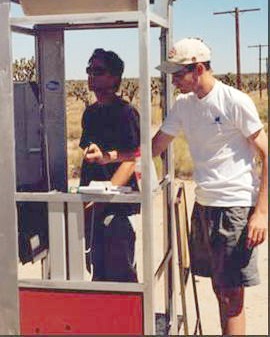 NOVICES AND CITY PEOPLE DID NOT LET THEIR LACK OF KNOWLEDGE STOP THEM FROM FINDING THE MOJAVE PHONE BOOTH. I THOUGHT THE PHONE BOOTH HAD A ODD, STRANGE--BUT GOOD ENERGY. APPARENTLY SO DID OTHER PEOPLE. GODFREY IN MY OPINION WAS A 1990s "CHRISTOPHER COLUMBUS", NOW THAT IS QUITE A CLAIM. BUT THE FACT IS, GODFREY TOLD THE PEOPLE WHO HAD ADVENTURE IN THEIR HEART BY WAY OF THE INTERNET, THAT THERE IS A "COOL" PLACE OUT WEST. GOT GUTS-- GO TO IT, THE MPB. LIKEWISE, COLUMBUS TOLD THE COMMONS IN EUROPE, THERE IS A RUGGED BUT WONDERFUL LAND ACROSS THE BIG WATER. WHAT ARE YOU WAITING FOR? IN THE FUTURE, I AM GOING OT HAVE TO WRITE A FICTIONAL SCREENPLAY ABOUT THE MPB AND THE CHARACTERS THAT VISITED THAT PLACE. ONE GUY, WHO WOULD GIVE TOURS TO THE BOOTH in 1999 WAS 63 YEAR OLD TOW TRUCK DRIVER CHARLIE WILCOX. TOW TRUCK DRIVERS HAVE GOT TO BE TOUGH, THEY WORK IN ALL KINDS OF WEATHER. SO IT WAS APPROPRIATE THAT THE GUIDE TO THIS MAGICAL ISOLTAED WILD PLACE -- WAS A TOW TRUCK DRIVER. 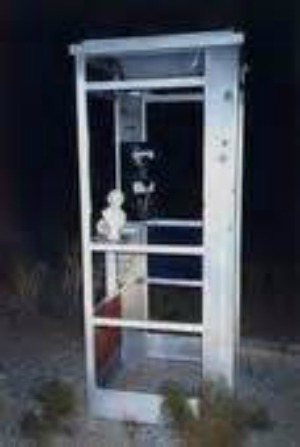 KEEP SENDING ME PHOTOS OF YOUR TIME AT THE HAUNTED PHONE BOOTH!!!!!! SO I CAN POST THEM, I AM IN THE PROCESS OF TRYING TO FIND SOME OF MY OLD B/W PHOTOS, BUT I THINK THE PHOTOS ARE LOST FOR GOOD. 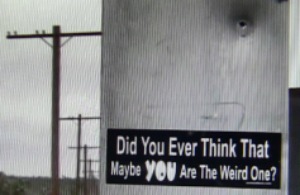 LEFT: THE PHONE BOOTH ALWAYS HAD INTERESTING GRAFFITI OR DECALS. 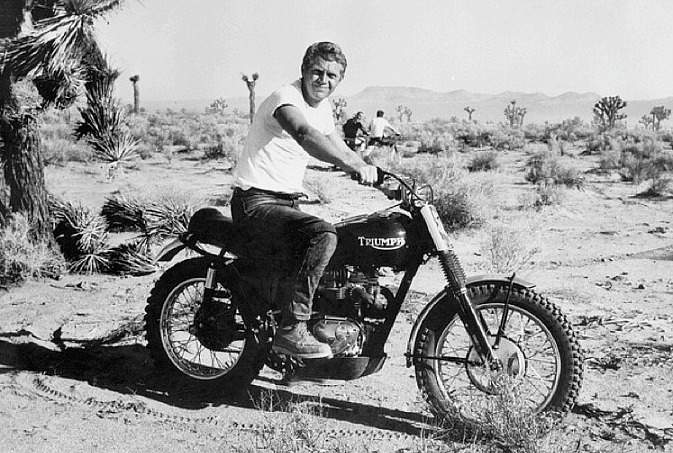 ANOTHER TALL TALE HAD ACTOR, "THE KING OF COOL" STEVE McQUEEN IN THE LATE 1960's RIDING HIS MOTORCYCLE IN THE DESERT AND FINDING THE BOOTH. "THE KING OF COOL" WAS AN ADVENTURER. SO, IS THIS YARN LIE OR TRUTH? WORDS OF WISDOM: NOTHING LASTS FOREVER, THINGS CHANGE! LIVE IN THE PRESENT, DO NOT WAIT ANOTHER YEAR OR MONTH TO DO SOMETHING. STOP MISSING OUT ON LIFE OR EXPERIENCES. GO FOR THE GUSTO! TAKE A CAMERA TO RECORD YOUR ADVENTURE. 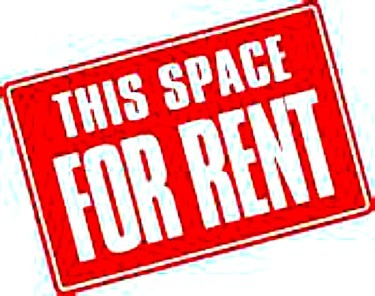 YOU MAY NOT GET ANOTHER CHANCE TO VISIT THAT PLACE OR BE WITH THOSE SPECIAL PEOPLE OR THAT SPECIAL PERSON. NOTHING IN THIS LIFE IS GUARANTEED. DO NOT HAVE ANY REGRETS OF I SHOULD HAVE VISITED THIS PLACE OR GONE THERE. Above: The phone is now gone… Below: However people still have MOJAVE PHONE BOOTH withdrawal. Below: Compare and contrast a phone booth in the city at night vs. the MOJAVE PHONE BOOTH after dark. RIGHT BELOW PHOTO (BELOW MAP)--THIS SNAPSHOT IS A REPEAT FROM TOP OF PAGE. THE POINT IS -- THIS PRE-1976 SNAPSHOT SHOWS WHEN THE PHONE BOOTH WAS NOT THAT DAMAGED. THE GLASS IS INTACT, LOOK AT THE GLASS REFLECTION. THE PLASTIC PLATE & STRIP IS BLUE. THE RIGHT BELOW NIGHT PHOTO IS LATE 1990s. NOTE THAT THE PHONE LIGHT IS WORKING, IT IS NOT SHOT OUT OR PULLED AND DESTROYED. IS THAT IS A CLUE AS IN YEAR OR DECADE? NOT REALLY, BECAUSE THE BOOTH WAS REPAIRED BY GOOD SAMARITANS AND MEMENTOS WERE LEFT AND COLLECTED. FROM AROUND 1997 ONWARD THE DESERT BOOTH -- BECAME A HAPPENING PLACE! IS THERE GLASS ON THE BOOTH IN THE NIGHT PHOTO? NO IT IS A TRICK OF LIGHT. BELOW: AN OFFERING, BUT SOMEBODY PUT THIS PLASTIC PINK FLAMINGO GIFT FOR THE PHONE BOOTH ATOP A NEARBY TELEPHONE POLE. IN ITS INFACY, THE PHONE BOOTH DREW THE OUTBACK EXPLORERS. THEN THE PHONE BOX BECAME FAMOUS, IT ATTRACTED THE WILD, THE MILD, THE SEEKERS, THE BYSTANDERS, THE TRUTH-ERS AND THRILL SEEKERS. NO MATTER WHAT, YOU HAD TO HAVE SOME MOXY TO GET THE MPB. 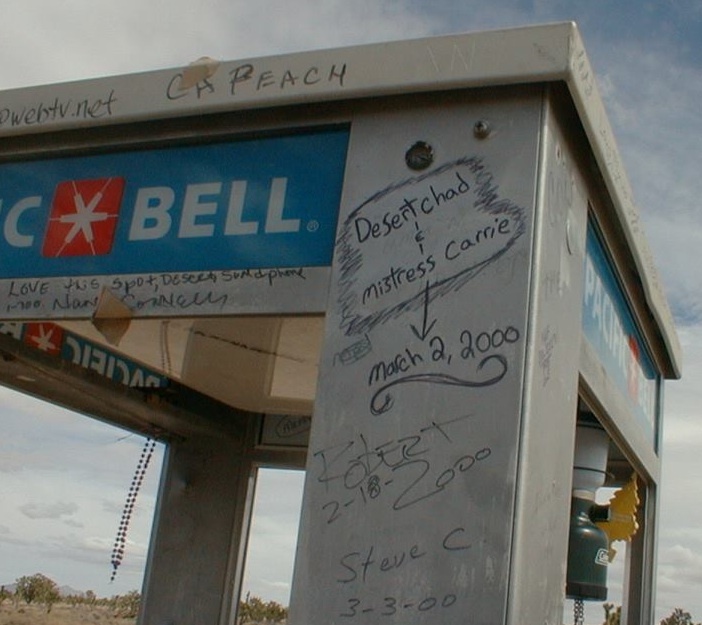 DURING ITS FINAL YEARS, THE MOJAVE PHONE BOOTH WAS DECORATED WITH ALL KINDS OF GIFTS AND GRAFFITI. 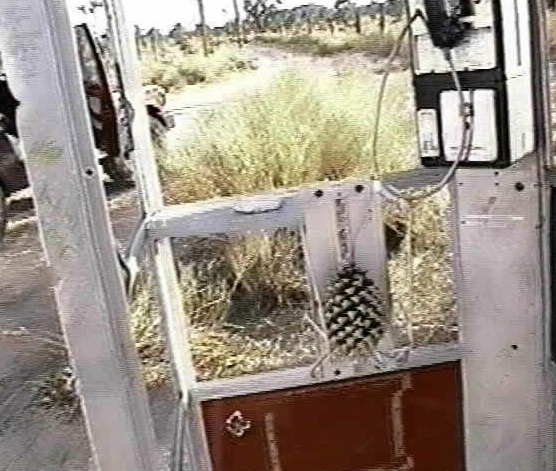 IN MAY OF 2000, THE HAUNTED DESERT TELEPHONE BOOTH WAS REMOVED. PRIOR TO IT BEING HAULED AWAY, THE PHONE BOOTH HAD BECOME A MECA FOR ADVENTURERS AND ECCENTRICS-- WHY? THE PHONE WAS OUT IN THE MIDDLE OF NOWHERE. A PHONE CALL TO THIS BOOTH OR FROM THIS DESOLATE SPOT WAS LIKE GETTING A HELLO FROM MARS. FOR THOSE THAT DID NOT WANT TO ROUGH IT, THERE WAS A CAPITALISTIC TOW TRUCK DRIVER WHO HAD A SENSE OF HUMOR (CHARLES WILCOX) WHO WOULD BE YOUR GUIDE. LET ME MAKE THIS CLEAR, THERE IS NOTHING WRONG WITH CAPITALISM, CORPORATE TYRANY IS DIFFERENT. LEFT PHOTO - CHARLES WILCOX MAKING A CALL AT THE BOOTH. WHAT BECAME OF GOOD OLD CHARLES? THS NEWS IS A DECADE PLUS OLD, (TRUE OR FALSE HEARSAY?) -- BUT THE MAN WITH THE TOW TRUCK WAS LIVING IN CALIFORNIA, AT HIS DAUGHTER's PLACE. IF I REMEMBER RIGHT, SAN DIEGO? ALL THE BEST FOR YOU SIR CHARLES! AS STATED NEAR THE TOP OF THIS PAGE,THE PHONE BOOTH WAS INTENDED TO BE AN S.O.S. LINE FOR RANCHERS AND MINERS OF THE AREA WHO HAD NO PHONE LINE. ACCORDING TO CAMP FIRE TALES OR LEGEND, EMERSON RAY A MOJAVE RESIDENT, IN THE 1940s BADGERED MA BELL TO PUT A PHONE IN THE DESERT, IN CASE SOMETHING BEFELL THE MINERS OR RANCHERS OF THE AREA. 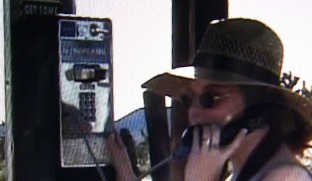 SO IS EMERSON RAY THE GENIUS BEHIND THE MOJAVE PHONE, WHICH LATER BECAME THE DESERT PHONE BOOTH? MAYBE? 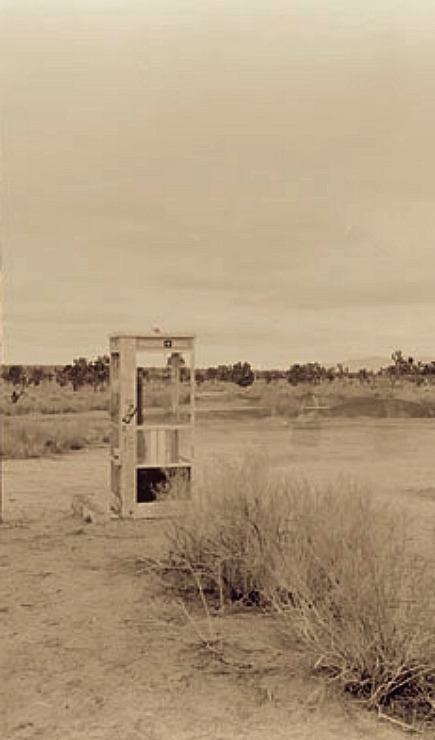 SHORTLY AFTER THE PHONE's INSTALLATION, CIRCA 1948, THIS PHONE BECAME KNOWN AS A LIFE LINE FOR THOSE WHO GOT LOST IN THE DESERT. NEED HELP, FIND THE SQUAWK BOX. 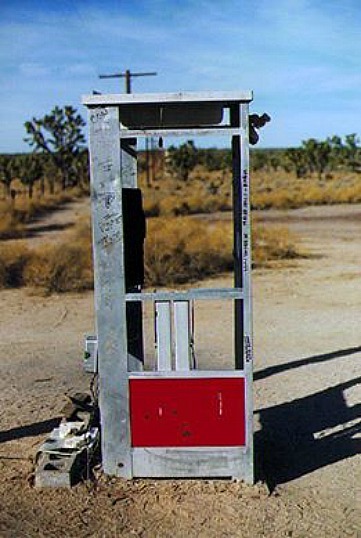 WITH THE ADVENT OF MOBIL PHONES THE PHONE COMPANY DEEMED THAT THE MOJAVE PHONE BOOTH WAS NOT PROFITABLE ENOUGH, SO PACIFIC BELL BRAINWAVES SIGNED THE DEATH WARANT FOR THE DESERT PHONE. BUT THE LOGIC THAT THE BELL COMPANY USED WAS FAULTY OR THERE REASONING IS A LIE. FROM THE MID 1990s, PACIFIC BELL OR MA BELL COULD HAVE RAISED THE PHONE CALL RATES TO THE HIGHEST LIMIT AT THIS LOCATION. AS IN VISITORS WOULD HAVE TO FORK OVER A LOT OF COIN TO GET THE LINE OPEN AND MAKE A CALL. YES, THE VOYAGERS TO THE DESERT WOULD HAVE PAID A HIGH AMOUNT FOR A CALL, ONCE THEY GOT TO THE MPB. AFTER GETTING TO THIS ISOLATED PLACE AND TO NOT MAKE A PHONE CALL--- THAT DID NOT HAPPEN. IN THE EXTREME, THE BELL COMPANY COULD HAVE HAD A PHONE COP THERE IN THE VICINITY OF THE CUBICLE MAKING CHANGE AND WATCHING OVER THE BOOTH. 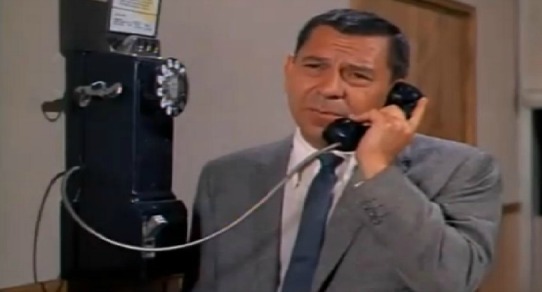 LIKEWISE -- TO CALL INTO THIS PHONE THE BELL COMPANY COULD HAVE ADDED A TREMENDOUS SIR CHARGE TO THE PHONE CALL. THE CURIOUS WHO WOULD CALL THE "PHONE BOOTH AT THE END OF THE WORLD", WOULD HAVE PAID IT. 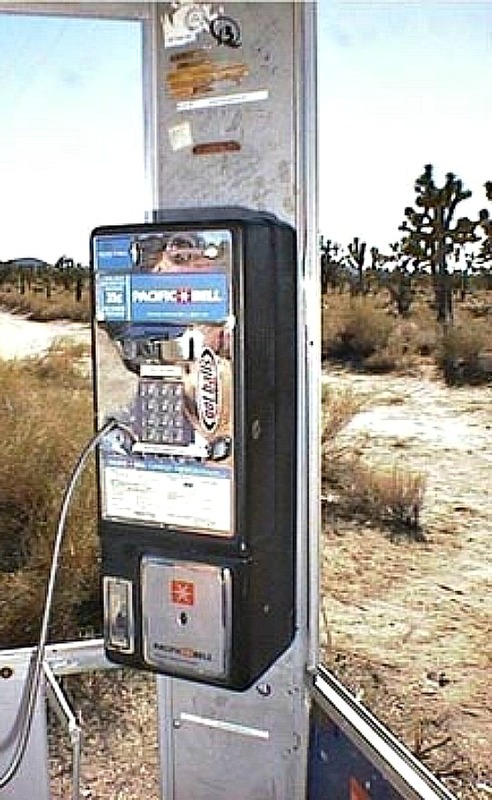 THE DESERT PHONE COULD HAVE BEEN A GOLD MINE FOR PACIFIC BELL BUT THE CORPORATE SUITS DID NOT THINK THINGS OUT. ALSO THE TREE HUGGERS DID NOT LIKE THE IDEA OF THE DESERT BEING TRAMPLED UPON OR DRIVEN OVER BY PILGRIMS IN SEARCH OF THE PHONE! THESE NATURE FANATICS HAVE NO SOUL. COMBINED TOGETHER, CORPORATE PENCIL MEN AND THE NATURE GESTAPO, MADE FOR THE END OF THE MOJAVE PHONE BOOTH. AS YOU STUDY THE PICTURES YOU CAN SEE THAT THE GEOGRAPHY AROUND THE PHONE BOOTH DID CHANGE THROUGH THE DECADES. THE MORE PEOPLE THAT VISITED BOOTH, MEANT THAT THE BAREN AREA AROUND THE PHONE EXPANDED. 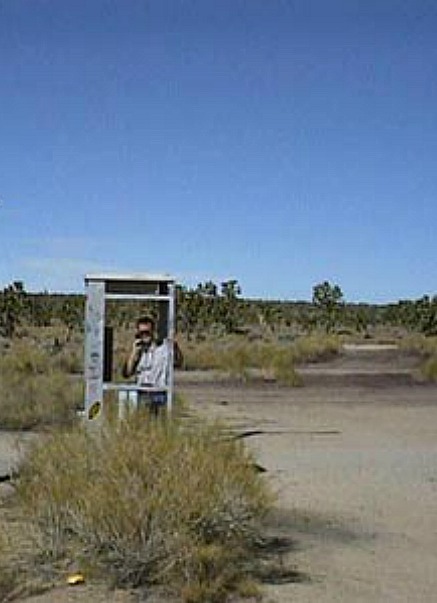 HOWEVER, EVEN WITH THE INFLUX OF PEOPLE, THE MOJAVE PHONE BOOTH WAS LIKE GOING OT THE MOON, IN HOW REMOTE IT WAS. THE REMAINS OF CAMPFIRES CAN BE SEEN IN SOME OF THESE PICTURES. THE CAMPERS MAINLY CAME DURING THE 1990s, PREVIOUS TO THAT, FEW PEOPLE STAYED OVER NIGHT OUTSIDE THE BOOTH. IN ONE OF THESE PHOTOS ON THIS PAGE, AND I AM NOT SAYING WHICH, MY NO LIMITS DECEASED SISTER AND NO RULES DECEASED HUSBAND PUT THERE "ID MARK" ONTO THE BOOTH. MY LOOP HOLE, IF I AM IN A COURT OF INQUIRY----- "YES, I WAS (SUPPOSEDLY) OUT IN THE DESERT WHEN THIS HAPPENED, BUT MY MIND FOGS". THAT IS MY ALIBI. I THINK "SUPPOSEDLY" GETS ME OUT OF THE LURCH FOR "SQUEALING", HA-HA. I AM PROBABLY WRONG, BUT I DO NOT THINK A CATTLE GUARD WAS BY THE PHONE BOOTH UNTIL THE 1960s. NO MATTER, WHEN THE PHONE BOOTH (MPB) WAS REACHED OR FOUND-- %99 OF THE TIME A GOOD TIME WAS HAD. AS YOU CAN SEE BY THESE PICTURES, TREKKERS WOULD LEAVE OBJECTS BEHIND, MESSAGES ON THE PHONE BOOTH, MEMENTOS OR BULLET HOLES IN THE FRAME. ONE WONDERS HOW MANY TIMES THE PHONE WAS DESTROYED OUT OF IDIOCY OR BY DESPERATE PEOPLE WANTING COIN. 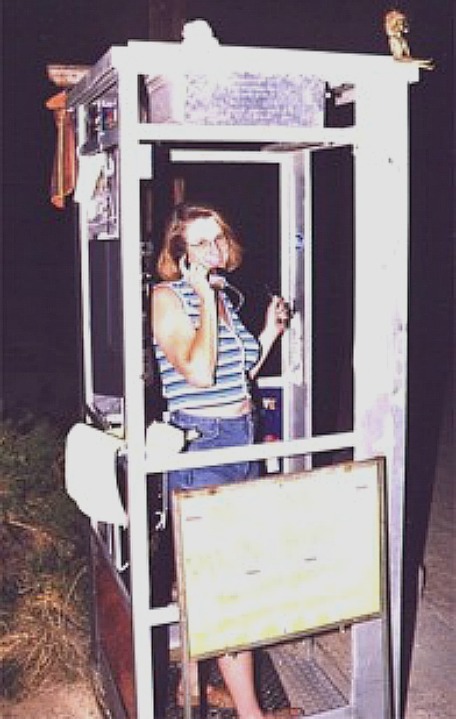 A LOT OF THESE PICTURES HAVE BEEN SENT TO ME OVER THE YEARS, THEY ARE OF THE NOW LONG GONE PHONE BOOTH AND OF PEOPLE THERE AT THE SITE WHO HAVE PASSED ON. IF YOU HAVE ANY SNAPSHOTS SEND THEM MY WAY. I AM LOOKING FOR SOME OF MY ANCIENT BLACK/ WHITE EXPEDITIONS PHOTOS AND WILL POST THEM IF I FIND THEM.. BUT I AM AFRAID THEY ARE LOST FOREVER. THE BOOTH AND THE GRAILERS AT TIMES WERE SERENADED BY PILGRIMS WHO BROUGHT MUSICAL INSTRUMENTS WITH THEM. THE TROUBADOURS HAD GUITARS, OTHER TIMES A CONGO DRUM OR HARMONICA. THERE WERE ALL KINDS OF STORIES OF HOW THE BOOTH WAS CELEBRATED IN SO MANY DIFFERENT WAYS, BE IT: MUSIC, GIFTS, VOODO DANCING, & TOASTING. ONE MURKY YARN; IS IT A LIE, A BOLLIXED UP TALE WITH THE WRONG CHARACTER, AN EXAGGERATION, OR THE TRUTH? BEFORE THE DESERT TELEPHONE BECAME FAMOUS, WILD MAN PERCUSSIONIST CHONGO LOPEZ (DECEASED), WHO WAS ALWAYS IN TROUBLE WITH THE AUTHORITIES AND CIVIES, BROUGHT HIS BONGOS TO THE DESERTED MPB AND HOWLED SONGS WHILE HE SLAPPED OUT HIS MUSIC. THIS OUTLANDISH TALENTED ENTERTAINER WAS THE KAISER SOZE OF ANTICS AND DRUMS OF DECADES AGO. WISH I HAD SOME PICTURES OF OLD CHONGO! LESSON IN ALL OF THIS TAKE PHOTOS, IN TIME THEY WILL BECOME PRICELESS MEMORIES! 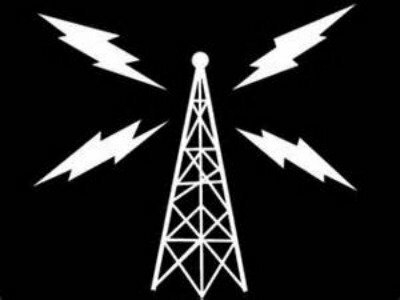 THE LEGEND CONTINUES TO GROW -- RADIO PROGRAM = DESERT PHONE BOOTH = CLICK ICON RIGHT - THE POLITICALLY CORRECT CONSERVATIONISTS WON THE DAY-- NO MORE MOJAVE PHONE B. 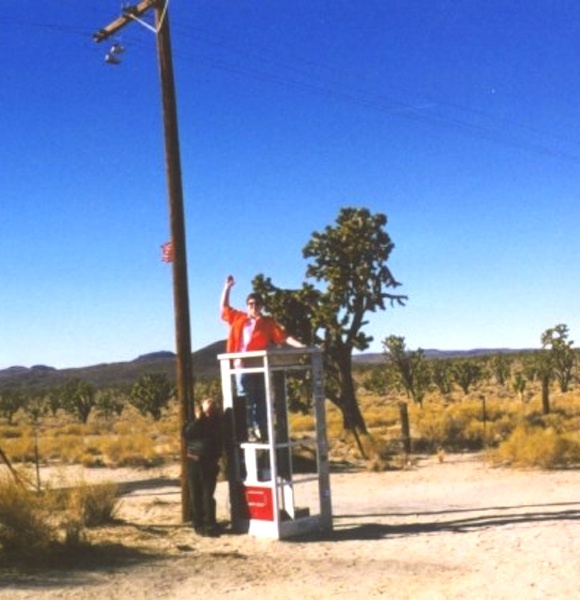 BELOW LEFT: THE LAST VIDEO SHOT AT THE MOJAVE PHONE BOOTH! THIS VIDEO WAS SOT DAYS BEFORE THE MAGICAL MOJAVE PHONE BOOTH WAS TAKEN AWAY! 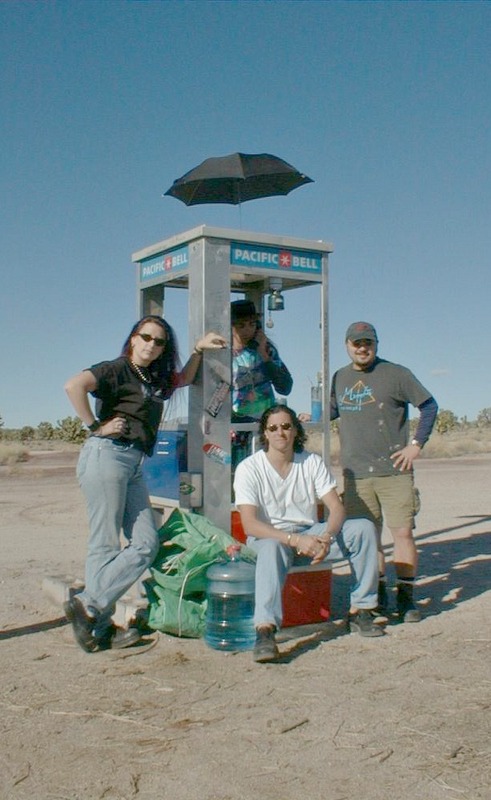 FROM THE MID 1990s ONWARD -- ALL WALKS OF LIFE VISITED "THE HAPPENING" MOJAVE PHONE BOOTH! THE BOOTH HAD MANY DIFFERENT PHONES. NATURE AND HUMANITY TOOK ITS TOLL! Some visitors to this site & those that visited the booth ages ago, thought the MOHAVE PHONE BOOTH was askew. Through the decades the phone booth was battered by the wind and by people. The top of the booth was perched on and pilgrims posed as acrobats while hanging onto metal the frame. Maybe the booth at times was a few degrees or many degrees off. However, many photos angle wise are deceiving, THE MPB was not The Leaning Tower of PISA. Yes, the box did have a few bullet holes, but look at the pictures, at a certain point in time the booth became a NON FREE FIRE ZONE. I AM GLAD I was wrong, at one time I thought the metal beams would be cut down by point blank shotgun fire. As mentioned before-- if the box was replaced, due to vandals, I did not know about it. ABOVE: WHAT YEAR? ANSWER = LATE 1990s. BUT THE CLUES THROWS YOU OFF. IT LOOKS LIKE THERE COULD BE GLASS ON ONE SIDE OF THE PHONE BOOTH, A MIRAGE. MAYBE THE MONKEY WRECH GANG FLAG GIVES THE PHOTO ANOTHER CLUE -- MONKEY WRENCHERS CAME INTO BEING IN 1975. THE EDWARD ABBEY GROUP. AS FOR THE BOAT -- IT LOOKS LIKE SOMETHING OUT OF THE OLD NOW DESTROYED "POP" -PACIFIC OCEAN PARK = AN AMUSEMENT PARK IN L.A. THAT CLOSED DOWN IN 1967. THIS IS A BIG MAYBE. 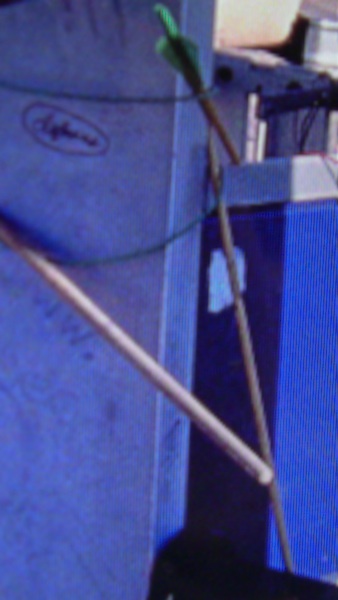 IS THE BOAT FROM THE "POP", AND WAS KEPT IN SOMEBODY's BACKYARD UNTIL? THEN PUT ATOP THE MPB? A COUPLE OF THESE PICTURES ARE OVER 50 YEARS OLD. SOME OF THE PHOTOS ARE--40 PLUS YEARS OLD. OTHERS 30 PLUS YEARS & THE LAST OF THESE PHOTOS WERE TAKEN IN THE YEAR 2000. THE YEARS ROLL ON & SOME OF THESE PEOPLE THAT WERE PHOTOGRAPHED AT THIS MAGICAL PLACE ARE NO LONGER IN THIS WORLD. BUT IN THESE PHOTOS THESE PEOPLE WERE HAVING FUN, LIVING AN ADVENTURE. 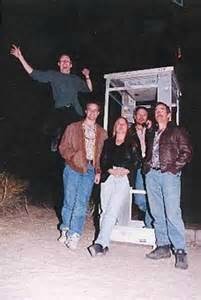 LETS HOPE THE WONDERFUL ENERGY OF THE MOJAVE PHONE BOOTH STAYED WITH THE PHOTOGRAPHED & THESE THRILL SEEKERS ARE ALL --STILL-- FILLED WTIH ZEST AND GUSTO! AFTER ALL __THESE PEOPLE CAME LOOKING FOR THE MAGICAL PHONE BOOTH AND FOUND IT! THEY WERE NOT FORCED TO JOURNEY OUT INTO THE DESERT -- THEY CHOSE TO! BLESSINGS TO ALL OF YOU WHO MADE THE TRIP! OR ARE CAPTURED BY THE ENERGY OF THIS PLACE OF DECADES AGO. KEEP THE GOOD MOJO ALIVE & STAY STRONG! 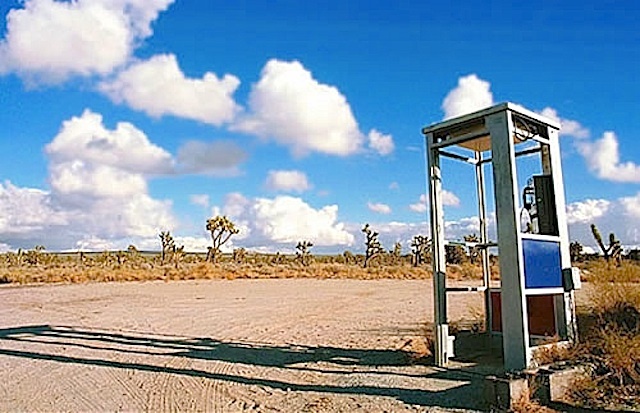 IF YOU GOT TO THE MOJAVE PHONE BOOTH, LEAVE YOUR MARK -- YOU MADE IT THERE, AGAINST GREAT ODDS! NOTICE HOW THE GEOGRAPHY & PHONE BOOTH CHANGED THROUGH THE DECADES. 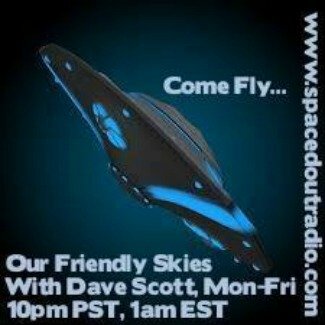 WARNING FROM A MAN ON THE RUN - FROM AREA-51 SECURITY! 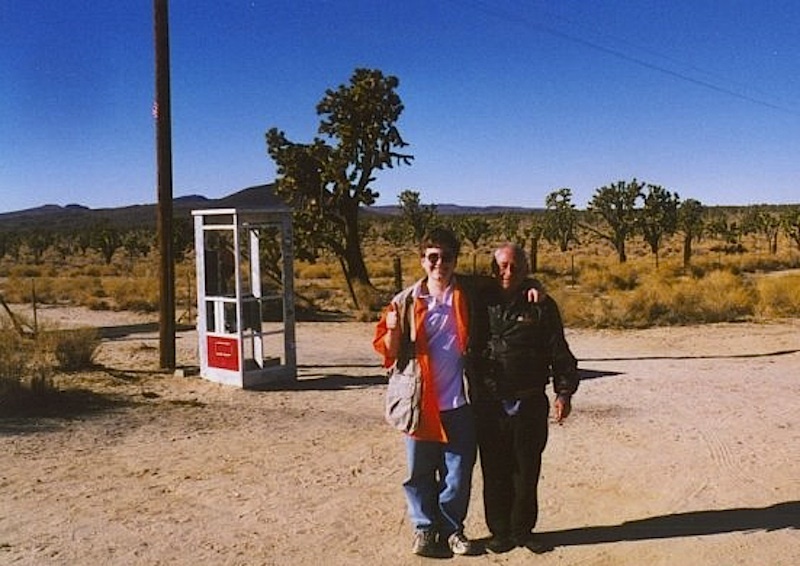 YOU NEVER KNEW WHO WAS GOING TO VISIT OR CALL THE DESERT PHONE BOX? 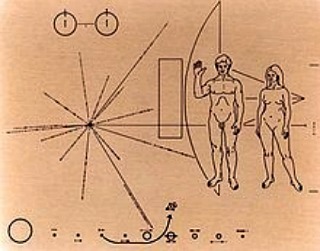 BELOW: THE PLAQUE THAT WAS ON SPACE PROBE "PIONEER 10". IN 1972 THE CRAFT WAS LAUNCHED. 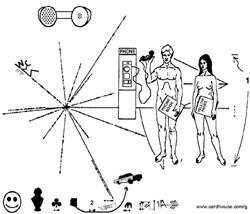 THE INSCRIPTION SHOWED MALE & FEMALE, THE SPACESHIP & THE MAP OF THE SOLAR SYSTEM. 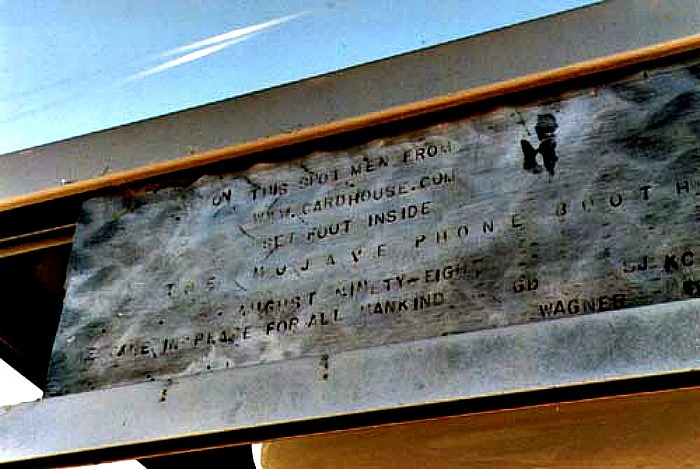 BELOW RIGHT; THIS PLAQUE WAS PLACED AT THE BOTTOM OF THE MOJAVE PHONE BOOTH. BELOW AUDIO- DESERT CHAD WAS A GOOD GUY WHO MADE A NUMBER OF EXPEDITIONS TO THE BOOTH--MAINLY BY HIMSELF. 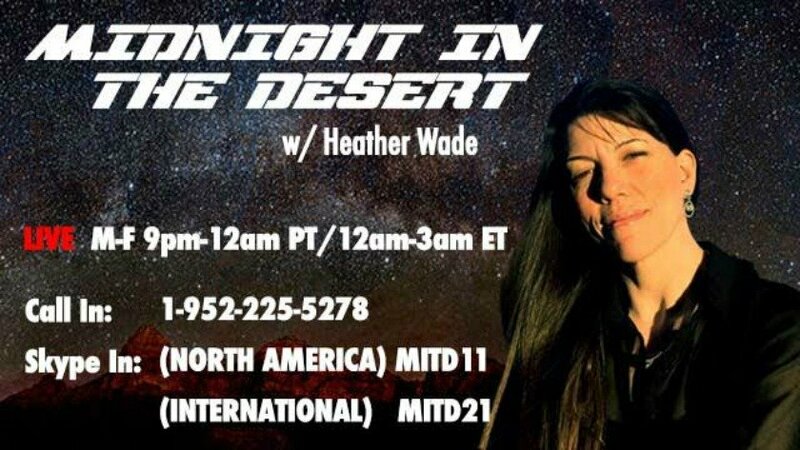 CLICK ON ICON BELOW- TO LISTEN TO -- "DESERT CHAD" -- ON "THE ART BELL SHOW". THE INTERVIEW STARTS ON 203:46 --- ENDS AT 241:52 /THIS MAN CAMPED OUT AT THE PHONE BOOTH & TELLS WHAT HAPPENED WHILE HE WAS THERE. 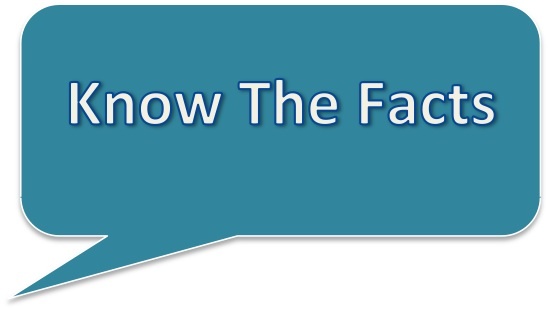 MYTH OR FACT? ALIEN INFILTRATION S.O.S. CAME FROM THE MOJAVE PHONE BOOTH! MAYBE IT DID? 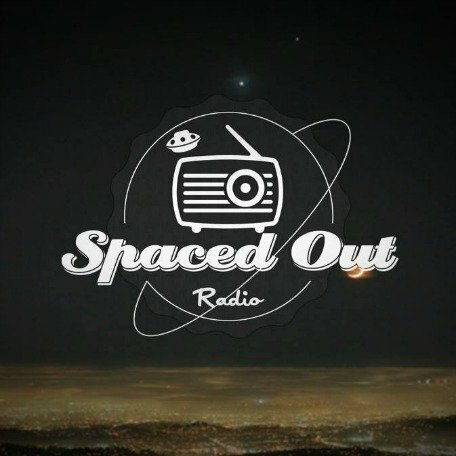 THE CALL AND UNEXPLAINED INTERRUPTION WAS HEARD LIVE IN 1997 ON "THE ART BELL SHOW"
ABOVE & LEFT & LEFT BELOW: CREATIVE PEOPLE TREKKED TO THE PHONE BOOTH. BELOW A YEAR OR TWO LATER. NOTE THE DIFFERENCE & CANDLE JARS TO LIGHT THE BOOTH AT NIGHT. 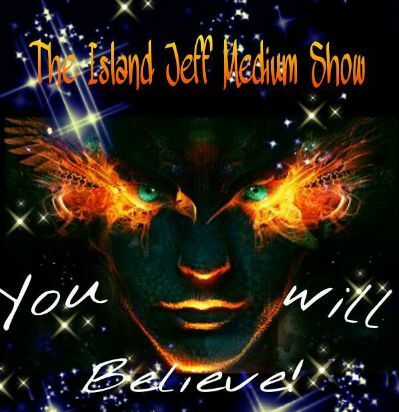 CLICK HERE: PAGE II -- THE HAUNTED WITH GOOD VIBES, MOJAVE PHONE BOOTH -- MORE STUFF!!! 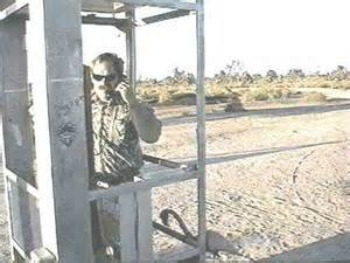 BELOW IS A LINK TO DOC DANNIELS KICKSTARTER -- DOC IS DOING A TRIBUTE TO THE MOJAVE PHONE BOOTH--BELOW THE LINK IS A VIDEO = WHO DOC IS & WHAT THE MPB WAS ALL ABOUT--- NO EXCUSES-- YOU GOT ONE LINK NOW TO KICKSTARTER! 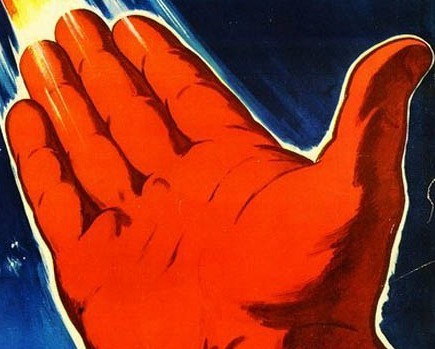 - SO YOU CANNOT GET LOST-- HELP DOC FUND HIS PROJECT! 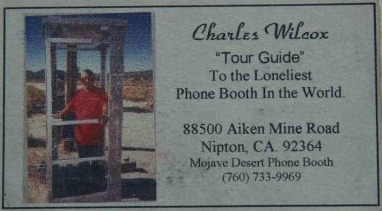 THE MOJAVE PHONE BOOTH DEMANDS TO BE REMEMBERED! HELP DOC OUT-- HE IS A GOOD GUY! THE BOOK IS NOW AVAILABLE!!!! ORDER = CLICK HERE --- TAKES YOU TO DOC's PAGE! 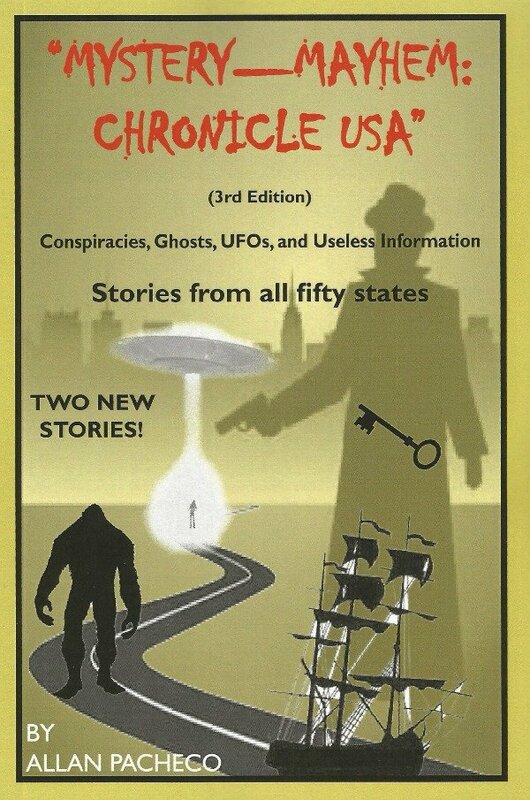 TALES FROM ALLAN's TOURS & INVESTIGATIONS. 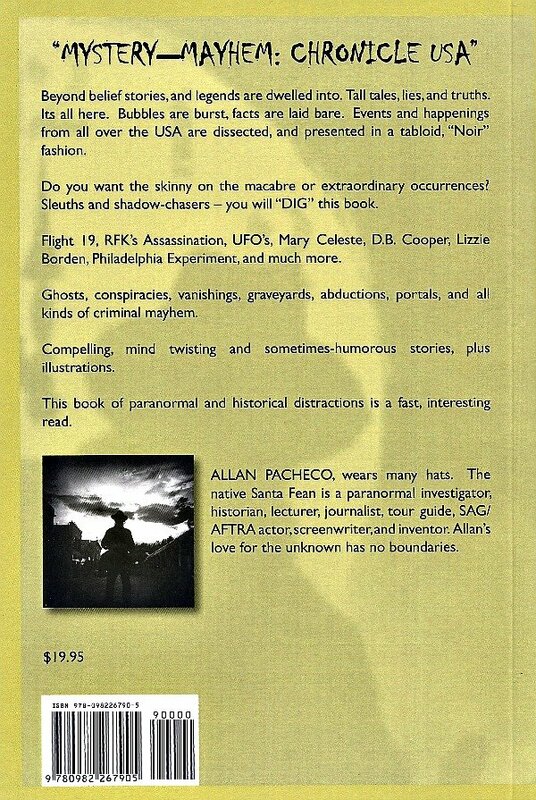 BELOW -- ALLAN's LATEST BOOK! 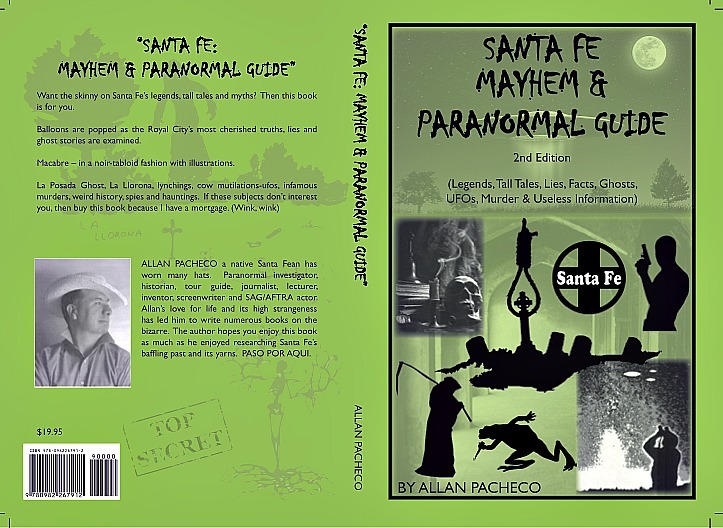 TO PURCHASE A BOOK -- CLICK ON ORDER BUTTON ON LEFT (MENU) or GO TO AMAZON .COM -- TEXT OR EBOOK ARE AVAILABLE.